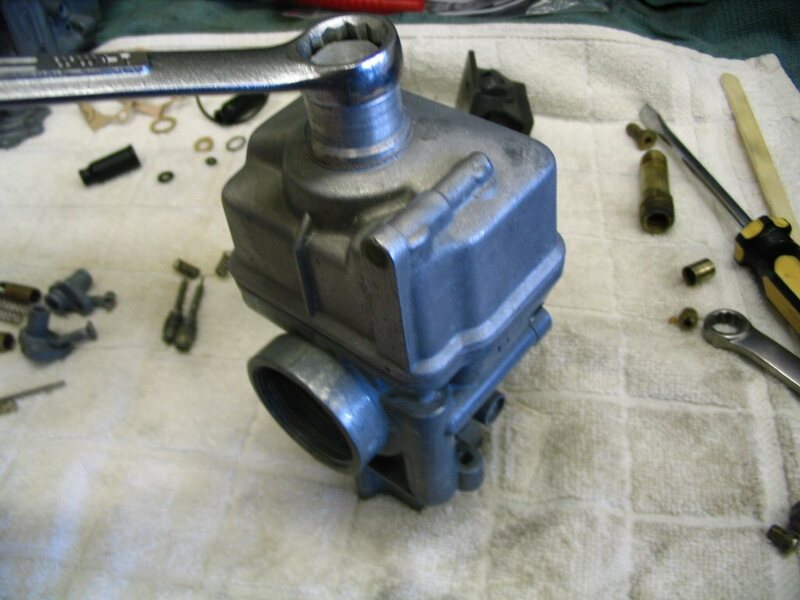 This is a series of photos I took during the assembly of the carburetors on my V1000 I-Convert project bike. 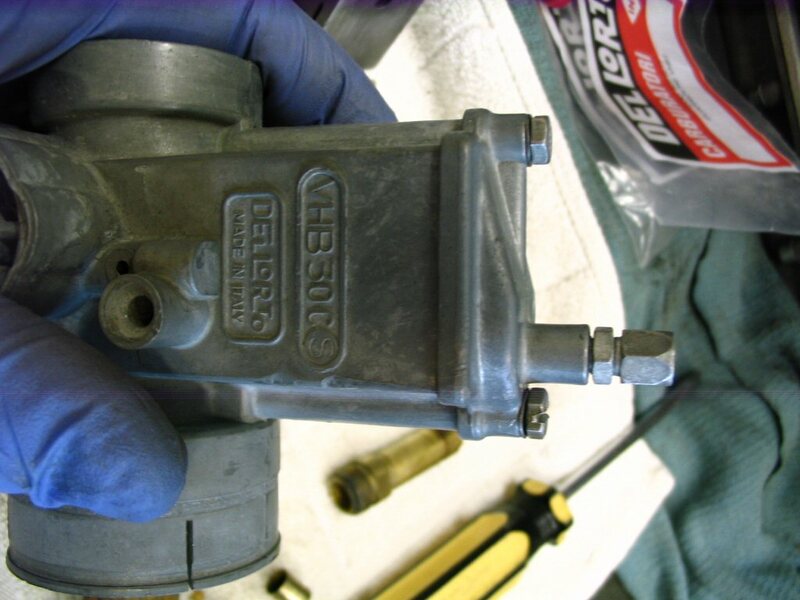 These are Dellorto VHB 30 carburetors. 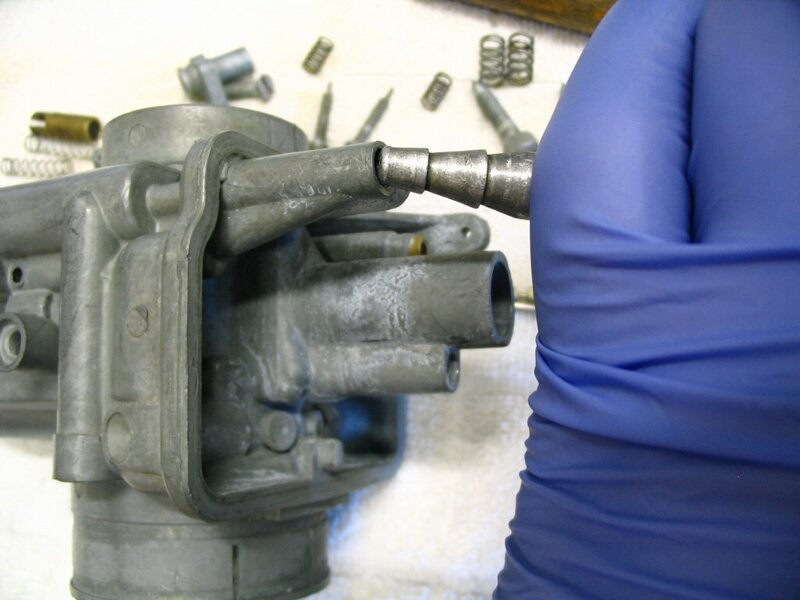 But, the procedure is 100% identical for Dellorto VHB 29 carburetors. Thanks to Charlie Mullendore of Antietam Classic Cycle, Robert Hawkes, Steve Farris, Adam S., and Joe Tokarz for making helpful suggestions for improvement. 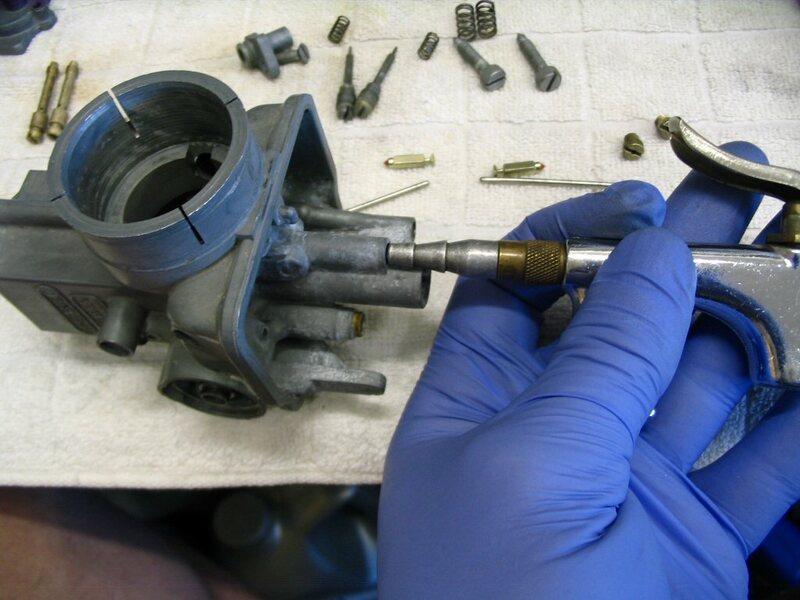 It is a very good idea to work on one carburetor at a time. 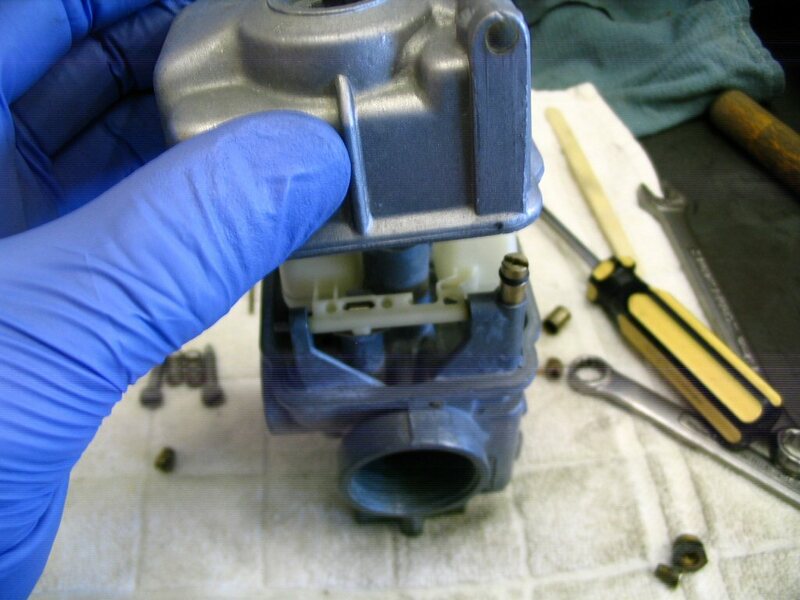 That way, you can refer to the assembled carburetor as a pattern. 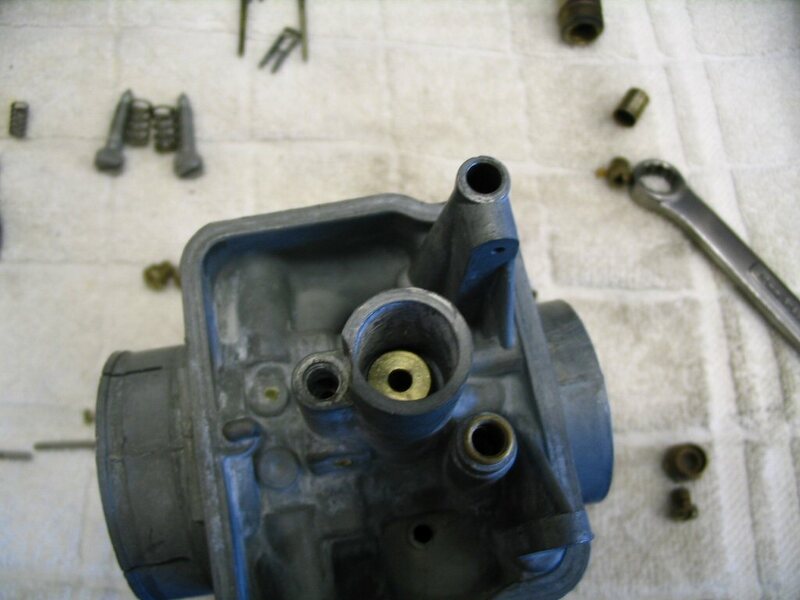 Disassembly is pretty much the reversal of assembly. So, just start from the last photo, and work your way up to the top. 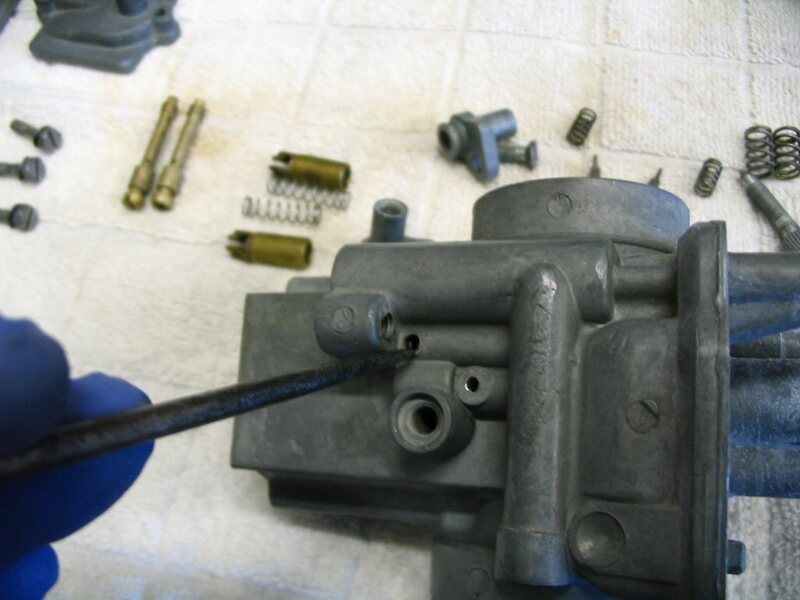 Prior to these photos being taken, I had completely disassembled both carburetors and soaked all of the metal parts in a bucket of carb cleaner. 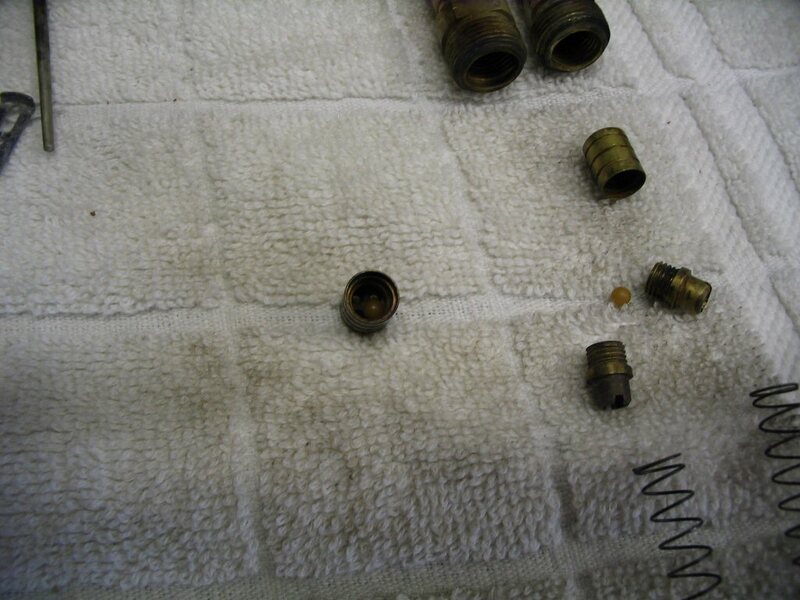 With the parts out of the carb cleaner, I thoroughly rinsed them in a bucket of rubbing alcohol. Rubbing alcohol dries very quickly, leaves no residue, and - in my experience - does a good job of neutralizing the carb cleaner (though I'm not a chemist and haven't a clue whether or not alcohol neutralizes the carb cleaner, or simply dilutes it to a point where it doesn't matter). Use gasoline if you like, but I prefer rubbing alcohol. 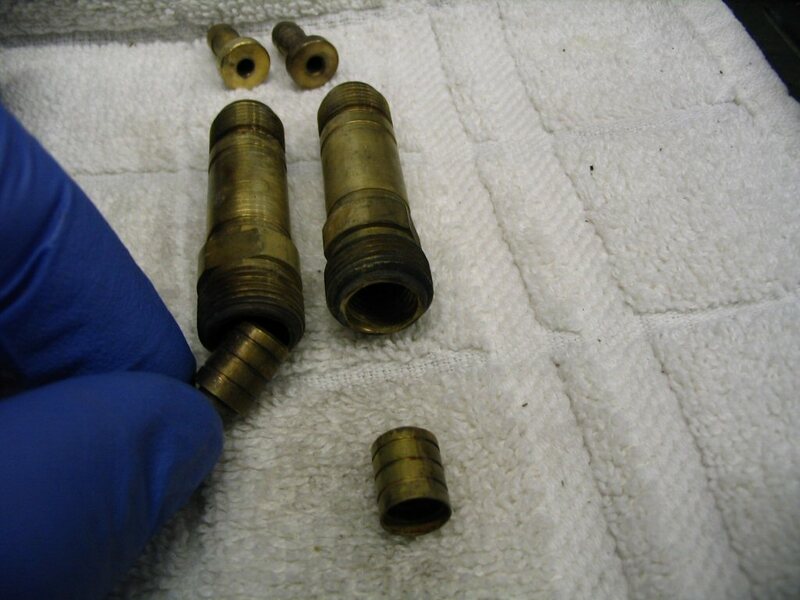 Even after cleaning, some of the brass parts appear discolored. Not to worry, they are clean and the discoloration really doesn't matter, as they will discolor again soon enough. 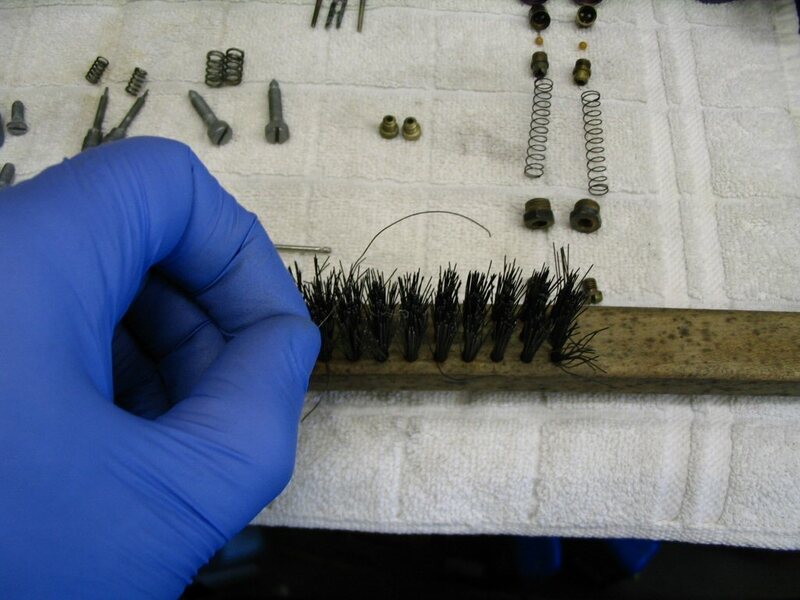 But, if you like, a quick turn at a fine wire wheel (not coarse or heavy) will polish them up nicely. 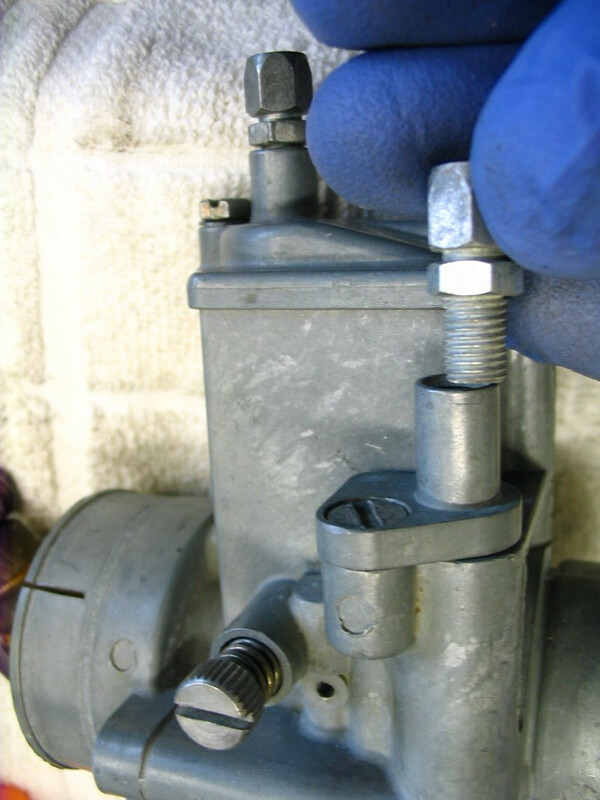 Just be cautious around the openings so that they are not enlarged and DO NOT WIRE WHEEL THE TAPERED NEEDLE AT ALL. 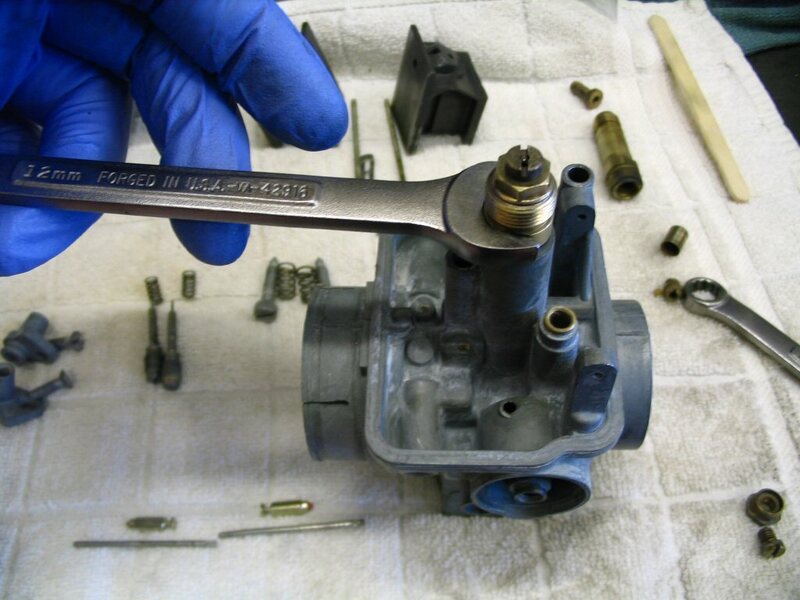 As an alternative, after soaking the parts in carburetor cleaner, Charlie Mullendore of Antietam Classic Cycle rinses them thoroughly in cold water, then hot water, and finally sprays through all of the passages with Berkebile 2+2 Gum Cutter. 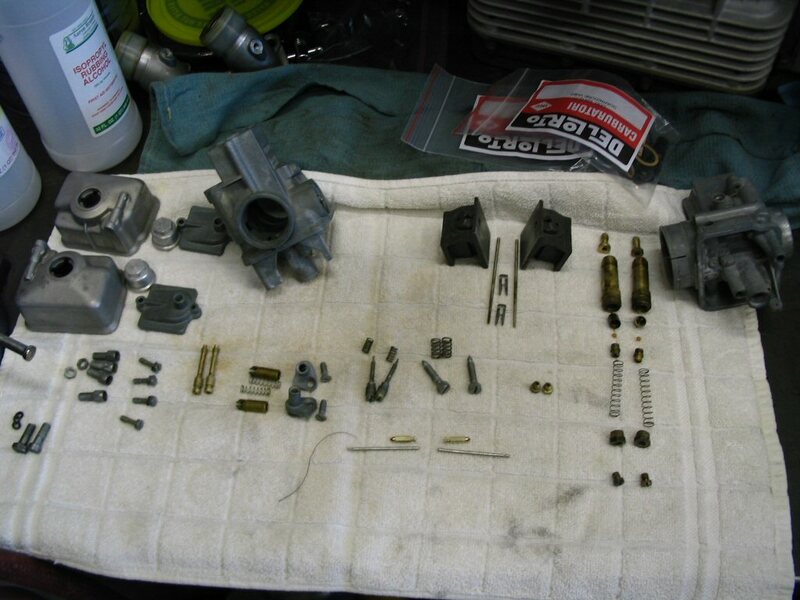 A bunch of carburetor parts! 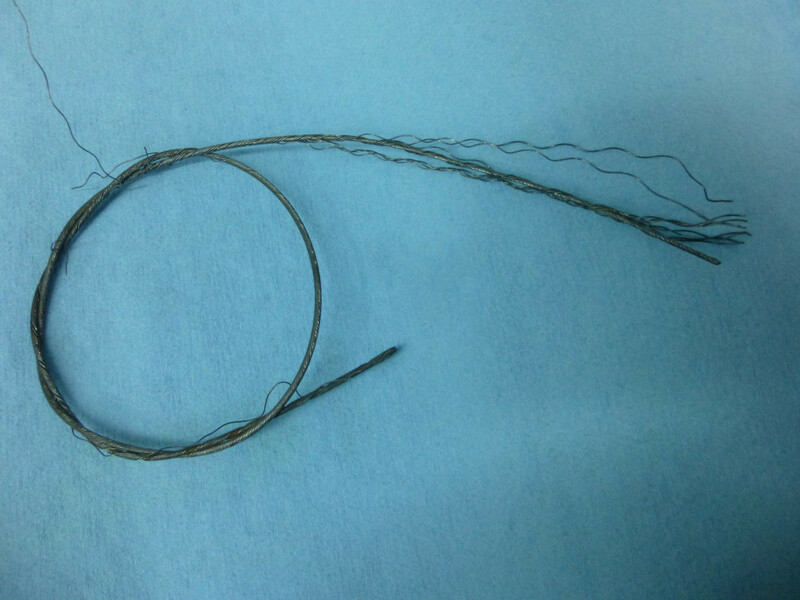 Here is a strand of wire I've pulled from a wire brush. The wire is stiff and strong, yet small enough to easily fit through the smallest passageways. The strand of wire next to a jet. 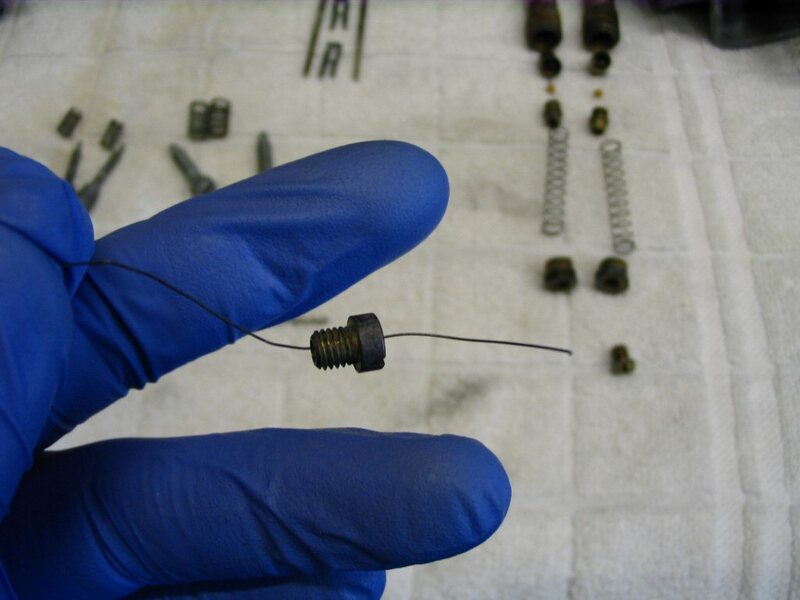 Insert the wire through the jet and spin the jet around a few times with your finger. Repeat with all the holes in all the jets: both main jets, both idle jets, both choke (enricher) jets, and both atomizers. Quick, simple, done. I learned this tip from my Dad, Tom Bender. 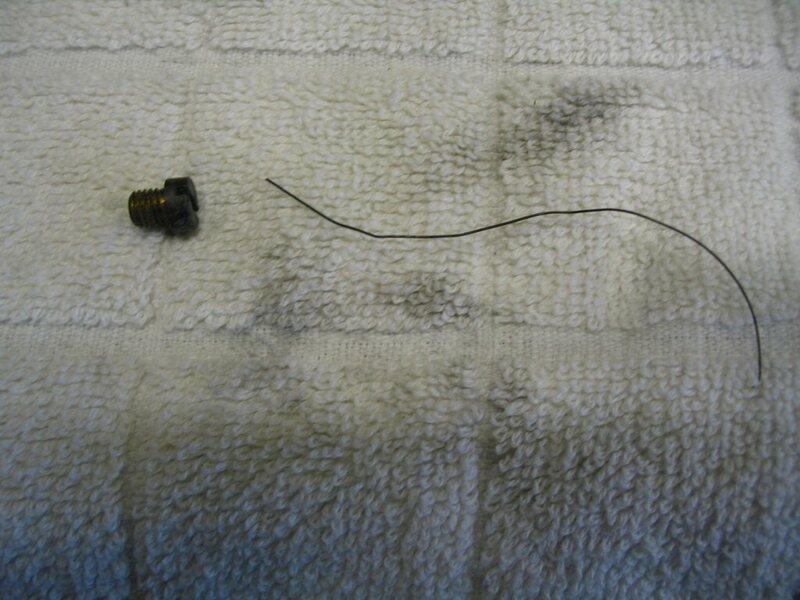 I have an alternative wire for carb jet cleaning. I use stands of wire plucked from old control cables. 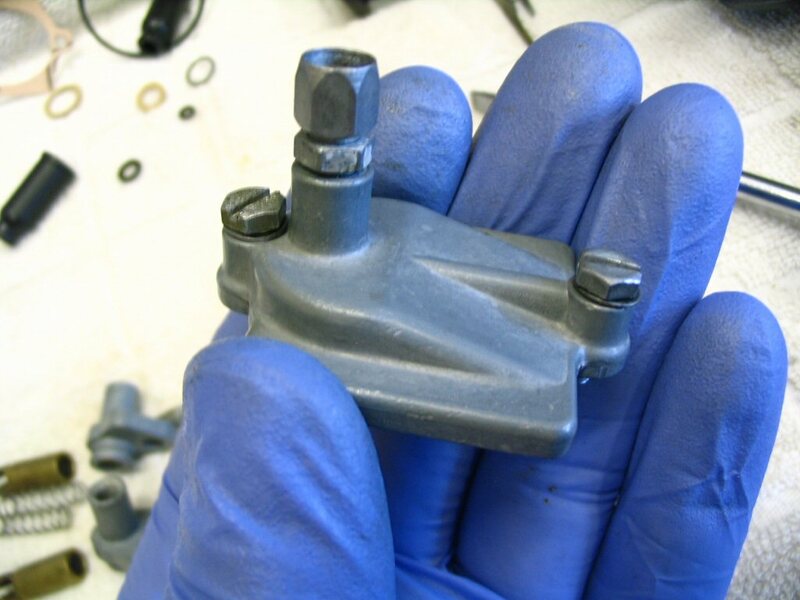 Throttle wires are the thinnest, and front brake is thicker. 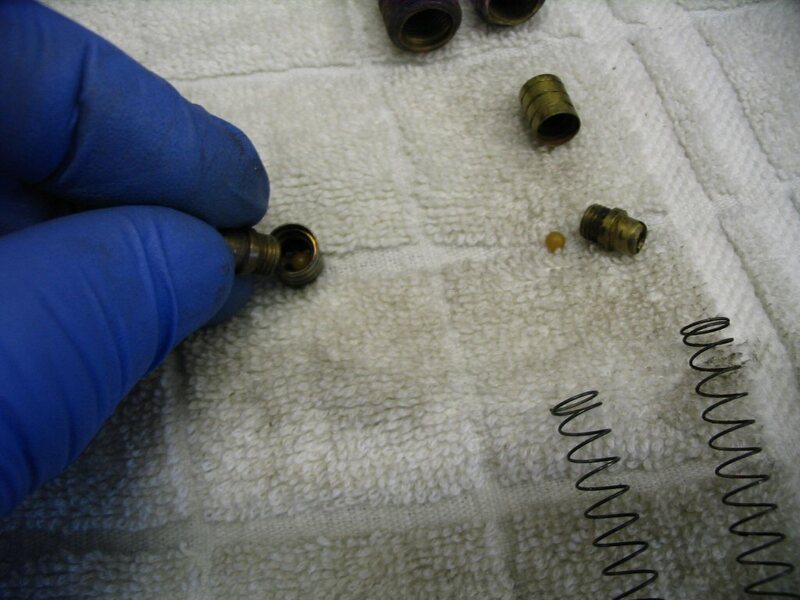 The wire is stiff and has a natural ripple to it and that makes orifice cleaning easy. Just be sure to cut the end clean; no burs. The wire can be straightened with pliers if needed. 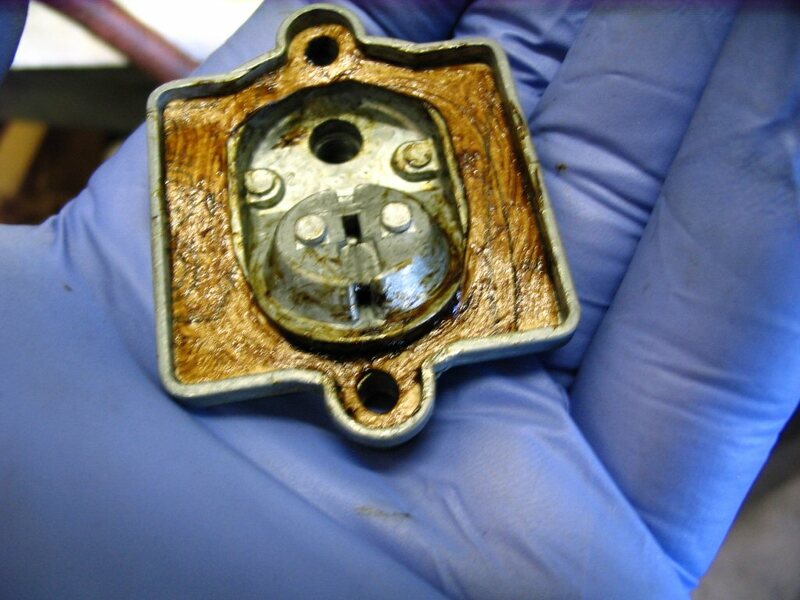 With this in mind I have been able to amass a supply of carb cleaning wires that will last for about 200 years. Photo courtesy of Joe Tokarz. ...you should feel air escaping from (a) the mixture screw hole, (b) two tiny holes in the throat of the carb (you've shown one - there's another closer to the atomizer hole IIRC) and (c) a small port at the inlet near the threads for the velocity stack (thanks to Charlie Mullendore of Antietam Classic Cycle for assisting in identifying air escape locations). ...you should feel air escaping from this location. 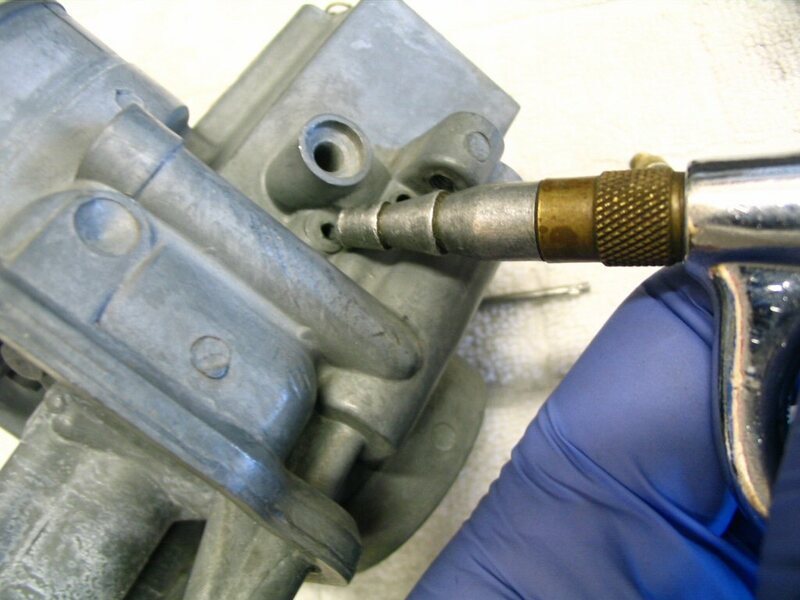 Blowing compressed air through the mixture screw location. 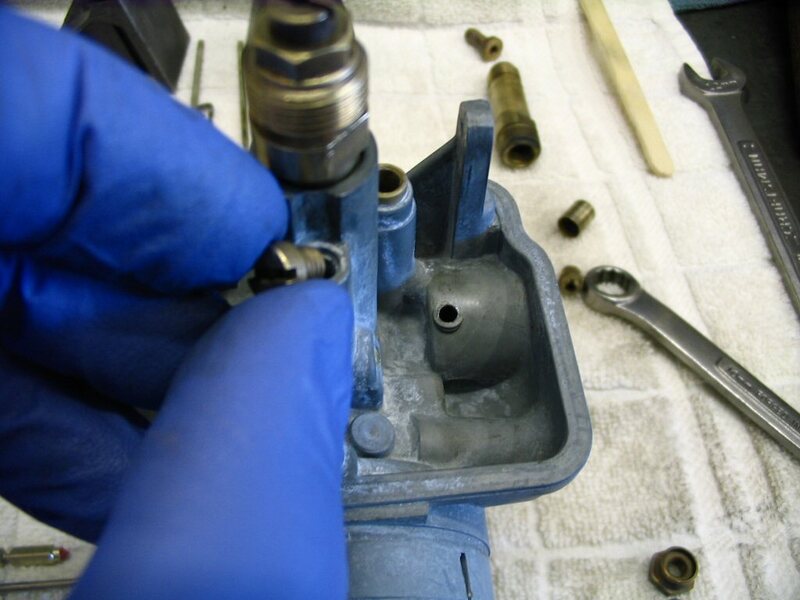 Note: Some prefer not to disassemble the accelerator pump piston; choosing instead to consider it perfectly functional if they hear the plastic ball bearing rattle inside the accelerator pump piston. 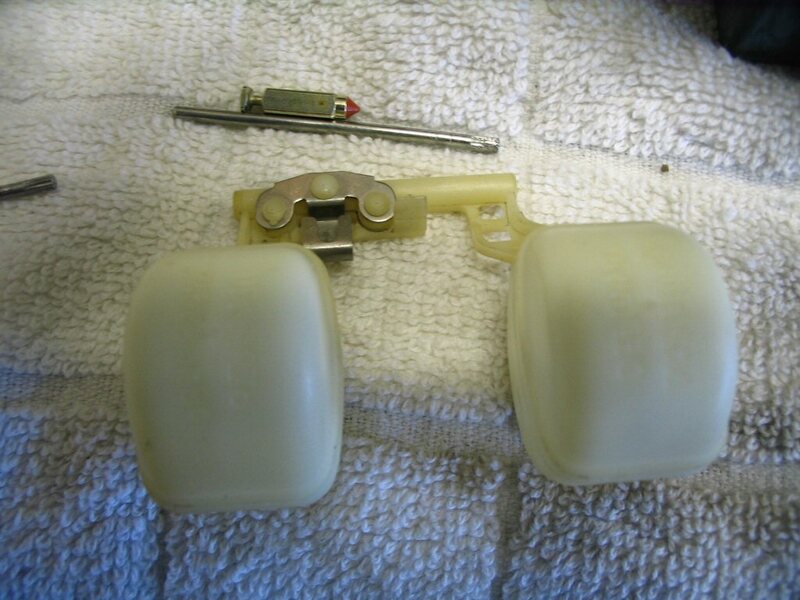 This is the small plastic ball bearing. 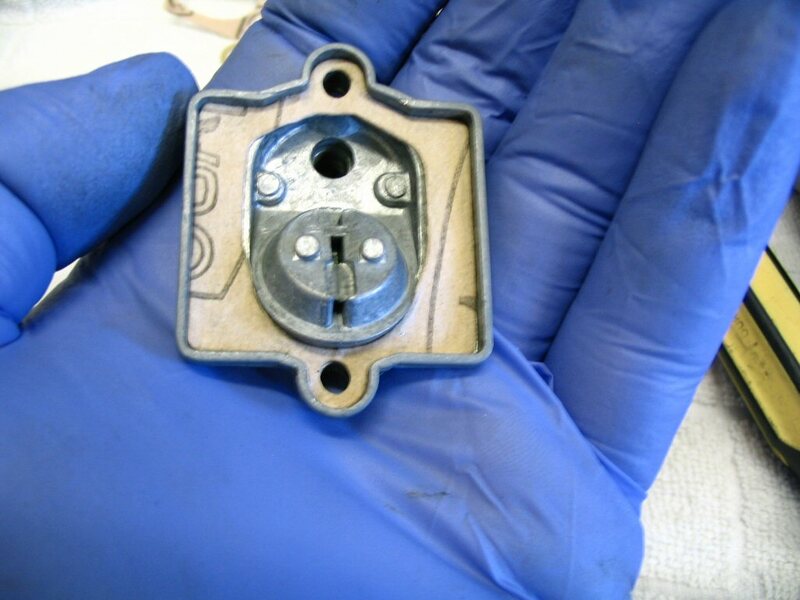 Place it inside the accelerator pump piston. 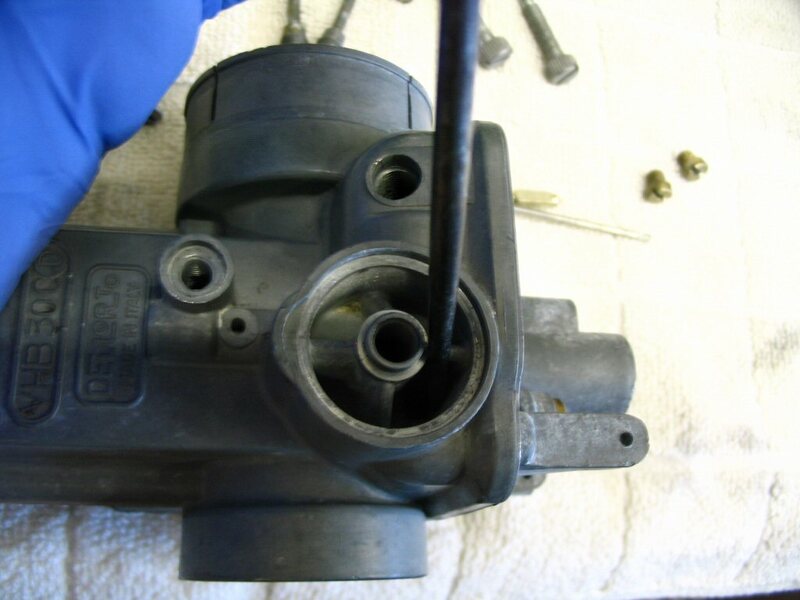 Screw the spring holder into the pump piston. 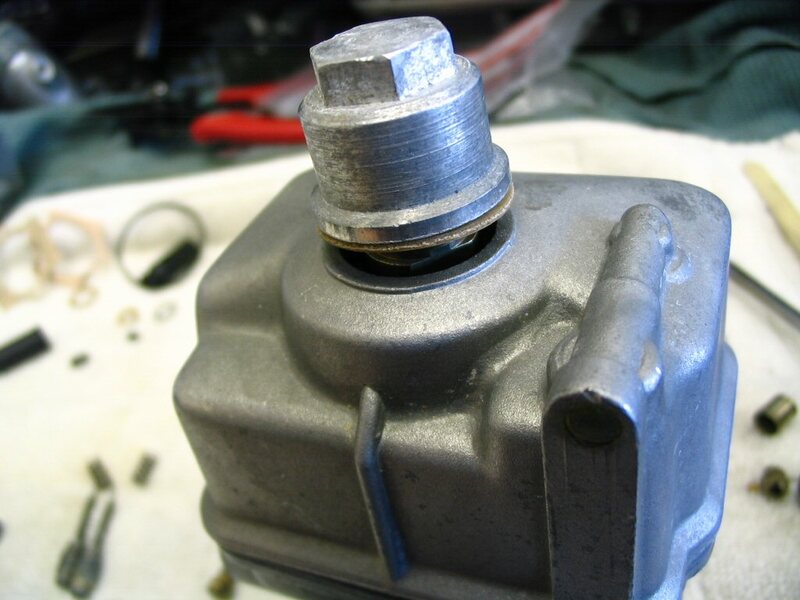 I keep the pump piston from rotating with a pair of snap ring pliers. 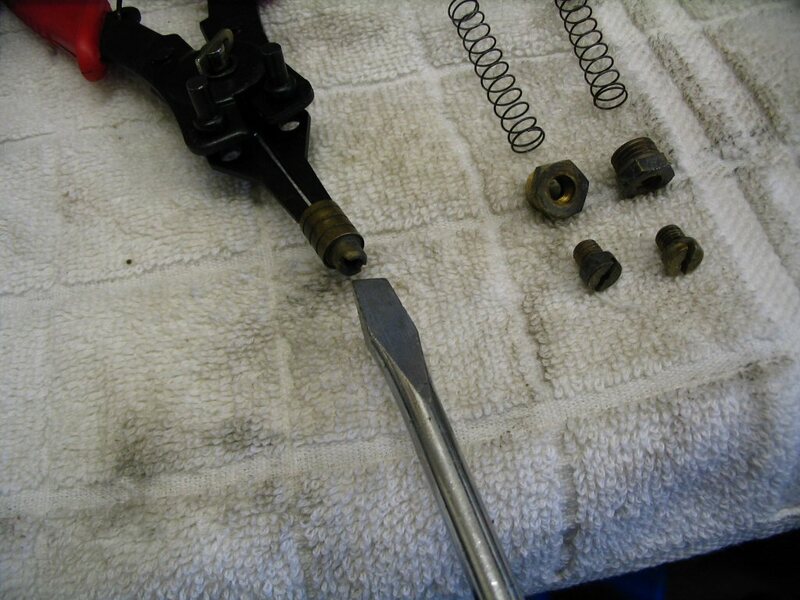 Then I give the spring holder a bit of a snug with a screwdriver. It doesn't need much, just a wee little bit. 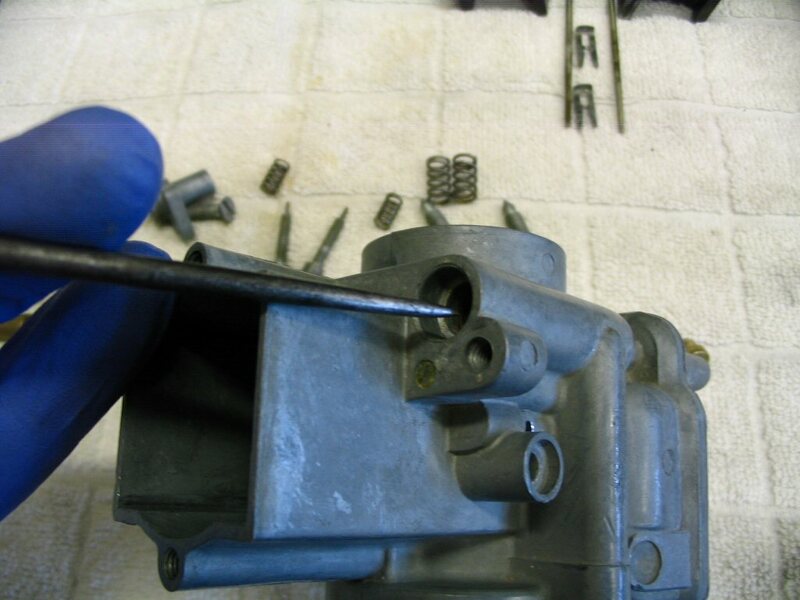 Now insert the assembled pump piston into the accelerator pump body. 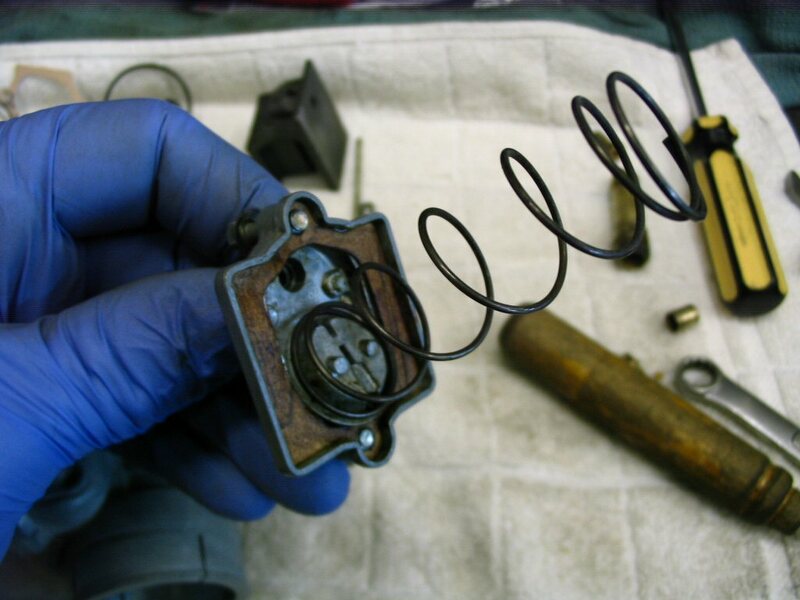 Place the spring on the end of the spring holder. Slide it into place and screw on the main jet holder. 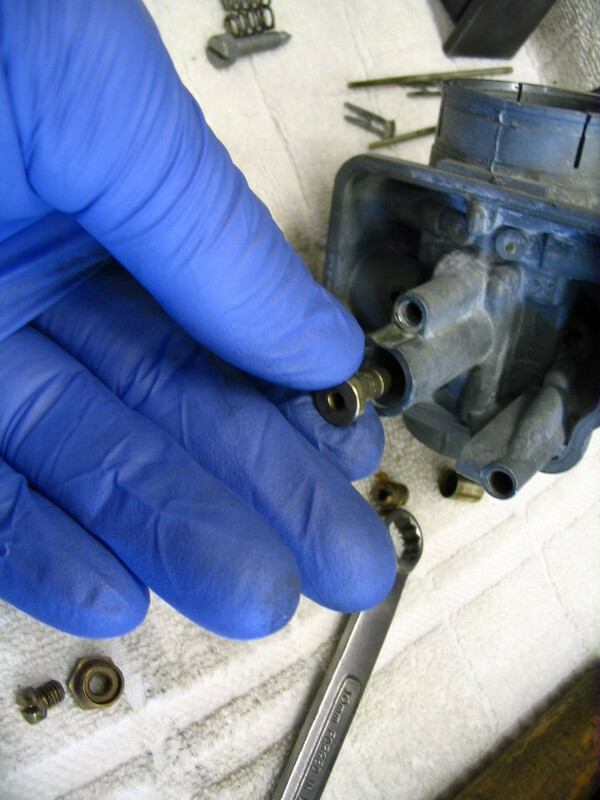 Tighten the main jet holder to the accelerator pump body with a pair of wrenches. Just a light snug. There is no need for much torque at all here. Now place the main jet into the main jet holder. 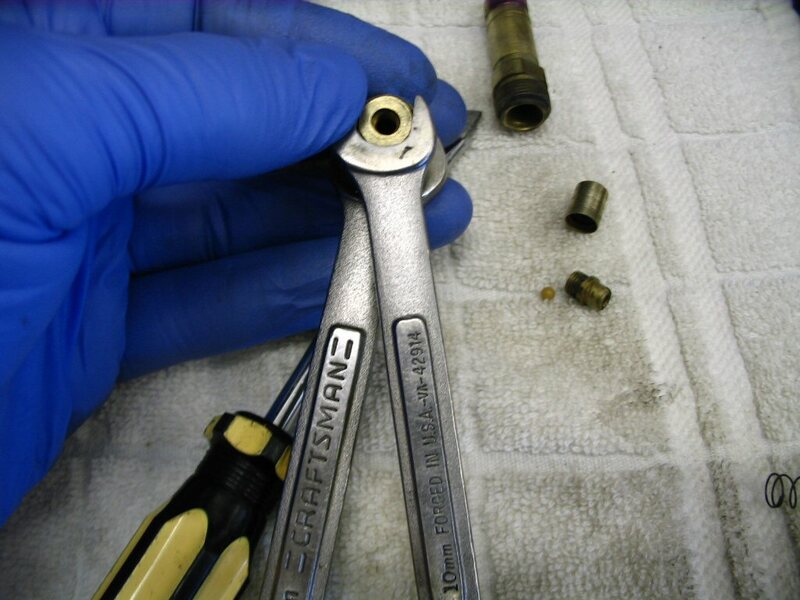 Secure the main jet in place with a wrench and a screwdriver. Just a light snug. Don't get carried away and strip the threads, etc. Place the atomizer into the main jet passageway. 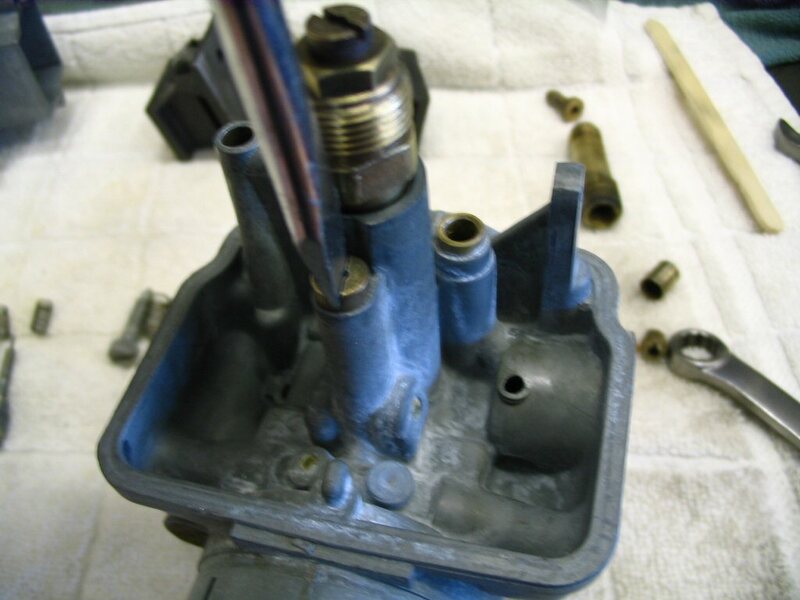 Set the carburetor on end and let the atomizer fall to the bottom. Use a wooden popsicle stick to push the atomizer into place. The wood is soft and you will avoid damaging the atomizer. I learned this tip from Charlie Mullendore of Antietam Classic Cycle. You'll know it is seated properly when you can see it protruding here. Note: I am using the ice pick as a pointer, I am not poking anything. Insert the accelerator pump assembly into the main jet passageway. 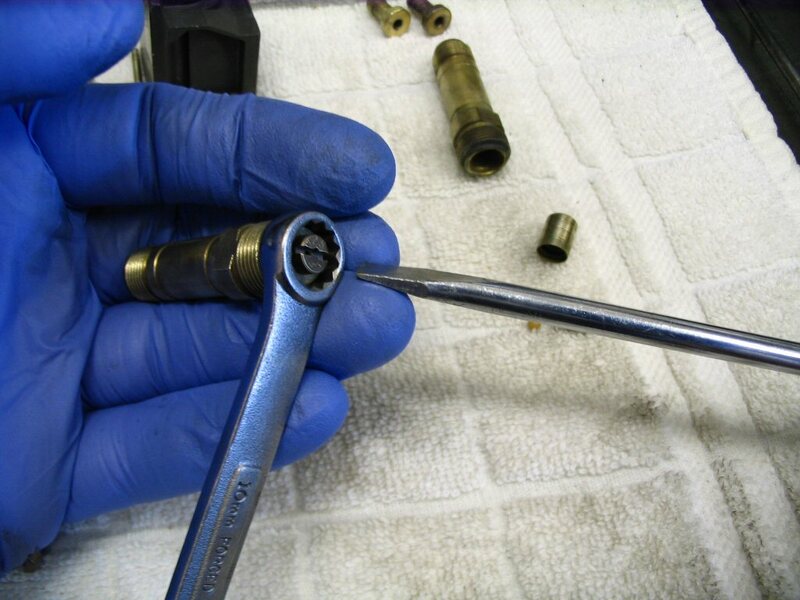 And tighten with a wrench. Just a light snug. 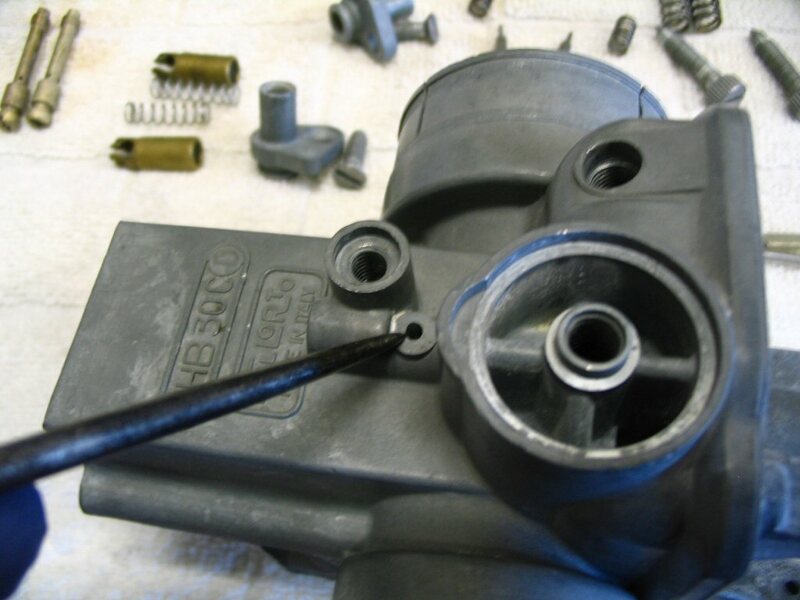 There is no need to start weight lifting just to assemble Dellorto carburetors. Insert the idle jet into its passageway. And tighten with a screwdriver. Just a light snug. 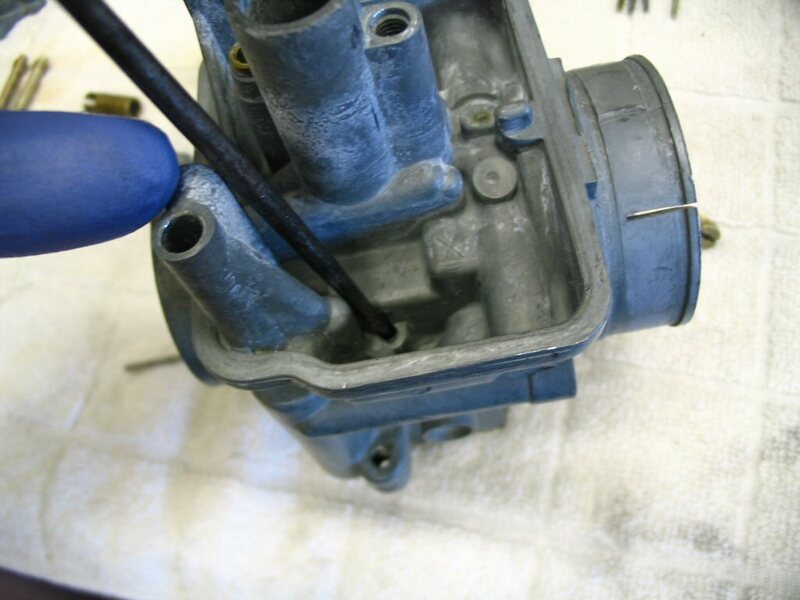 You should be getting a very clear picture by now that nothing on the carburetor requires much torque. 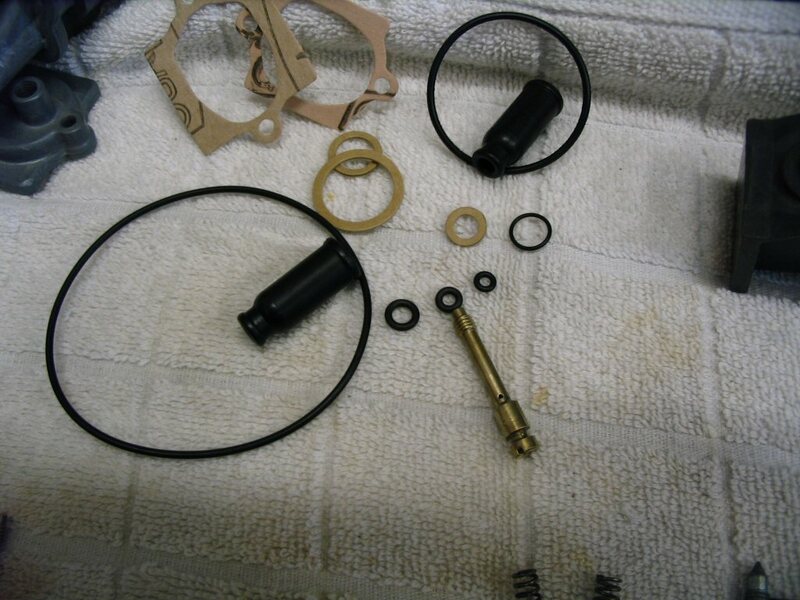 Here is the contents of the carburetor kit. 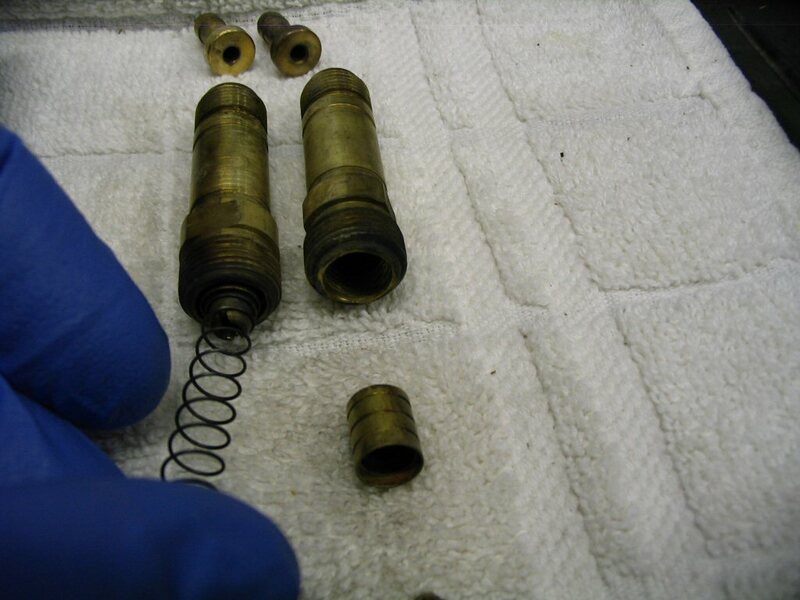 Notice that there are 3 small O-rings. 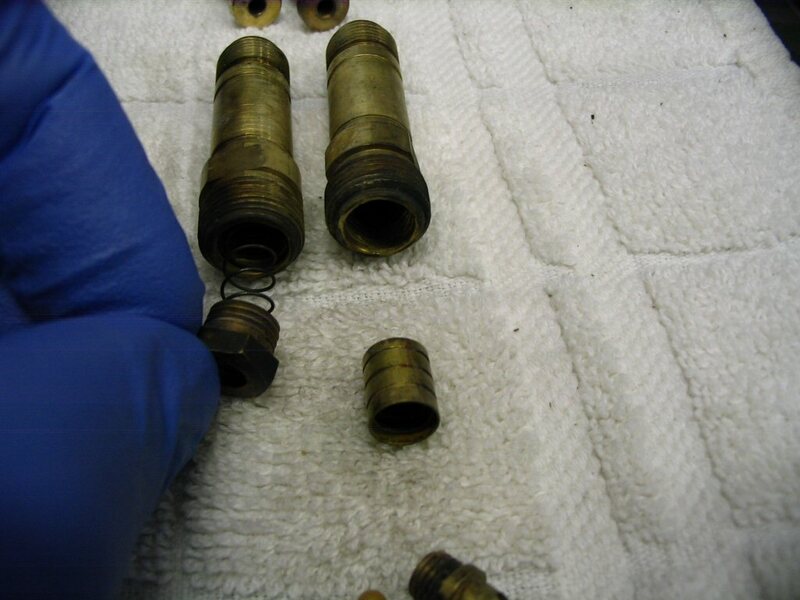 The middle sized one is used for the choke (enricher) jet. I position the O-ring like this, and then push it over the top. I've found this method easier than trying to bring it up from the other end. Charlie Mullendore of Antietam Classic Cycle prefers to slip it up over the threaded end first, then work it over the larger end into the groove. Either way works fine. 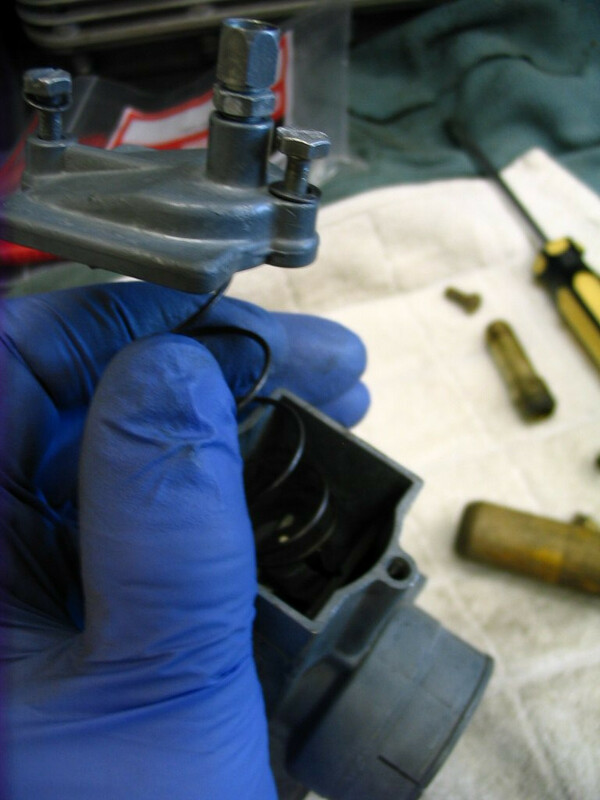 Charlie recommends using silicone spray lubricant on the O-ring to help it slip on easier. 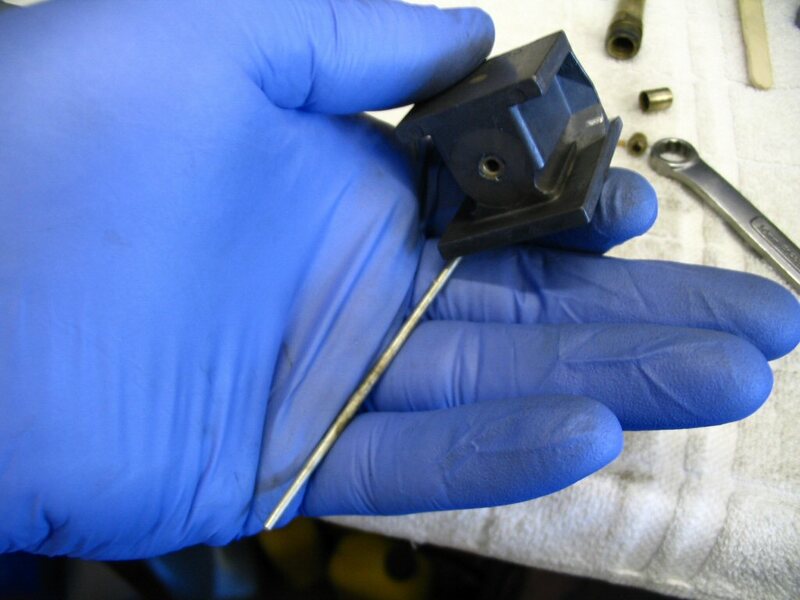 Note: Gary Frankel sent me information about the simple tool he made to make installing this O-ring much easier. 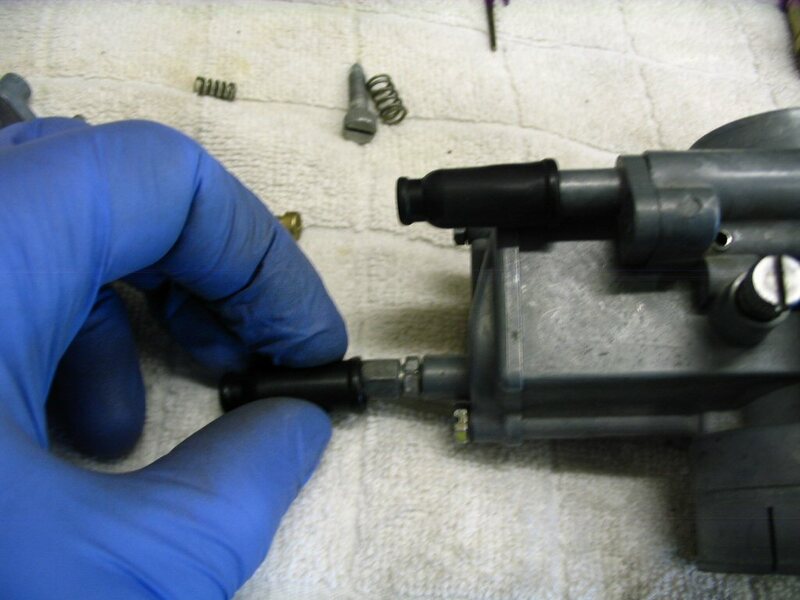 Check out his tool for installing the enricher jet O-ring on Dellorto carburetors. 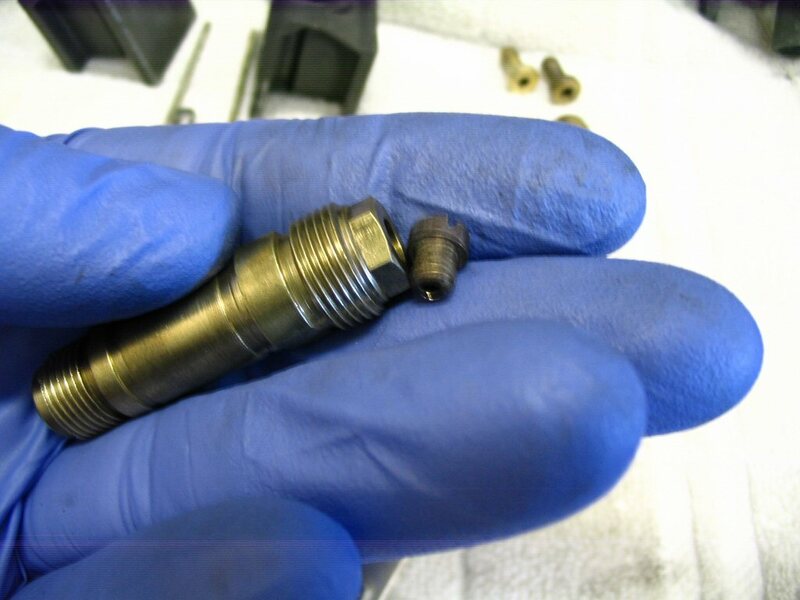 Here the O-ring is in place on the choke (enricher) jet. 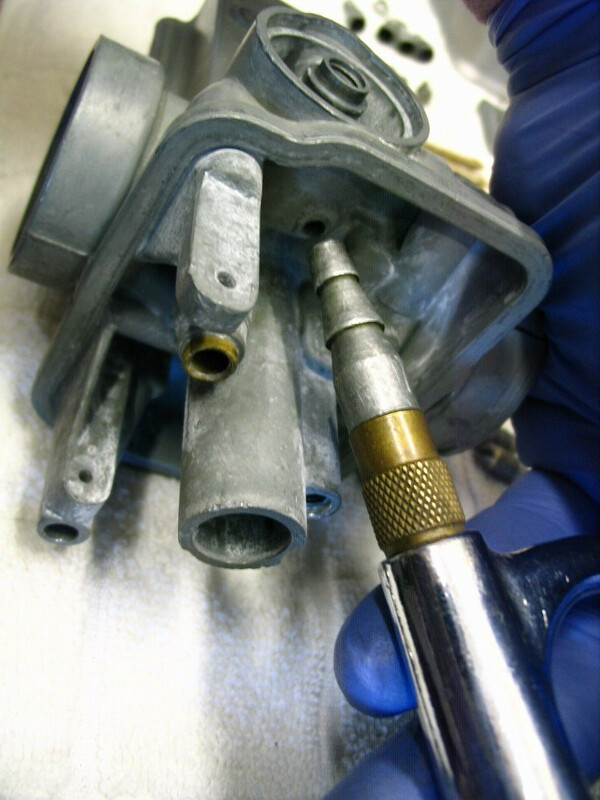 Insert the choke (enricher) jet into the body of the carburetor. And tighten with a screwdriver. Just a light snug. This is the float, float pivot pin, and float needle. 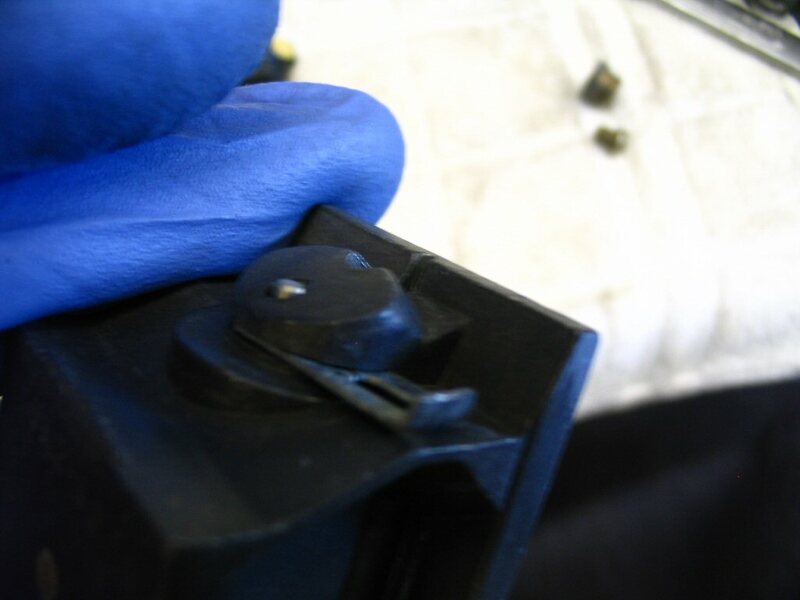 Place the float needle into the clip on the float. 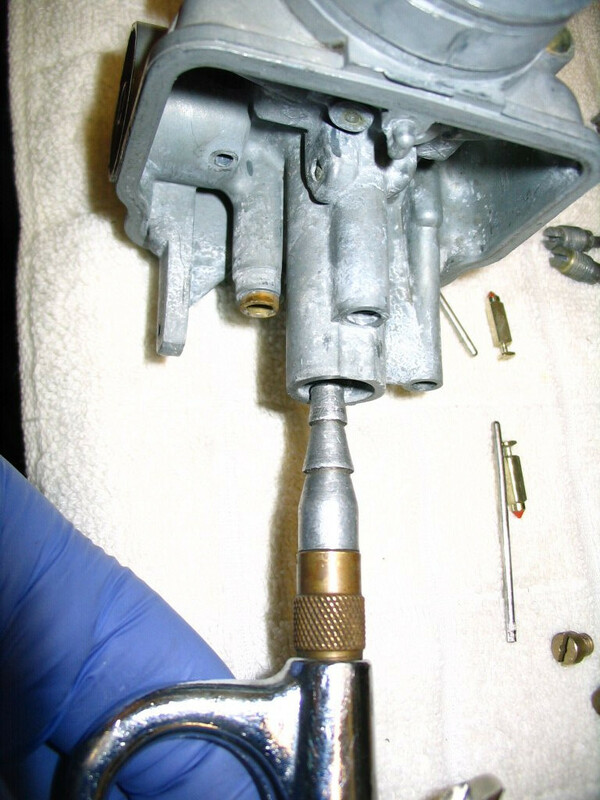 Insert the float needle into the carburetor body and position the float between the hinges. 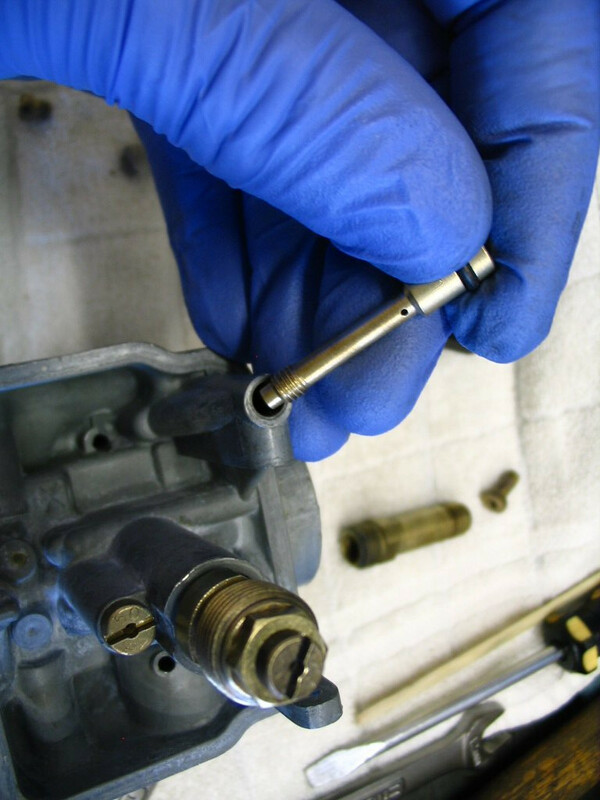 Insert the float pivot pin. And push it through to the other side. USE YOUR FINGERS ONLY! 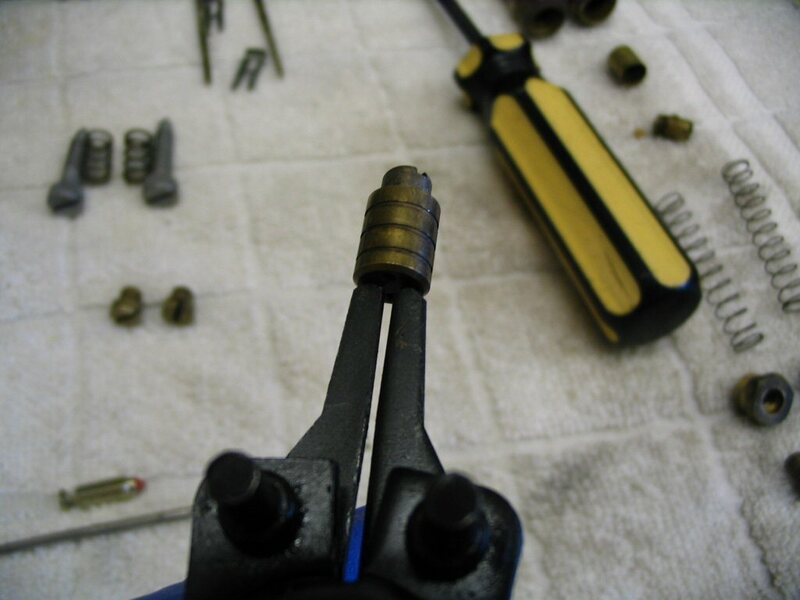 There is no need whatsoever for the float pivot pin to be hammered or wedged into place. 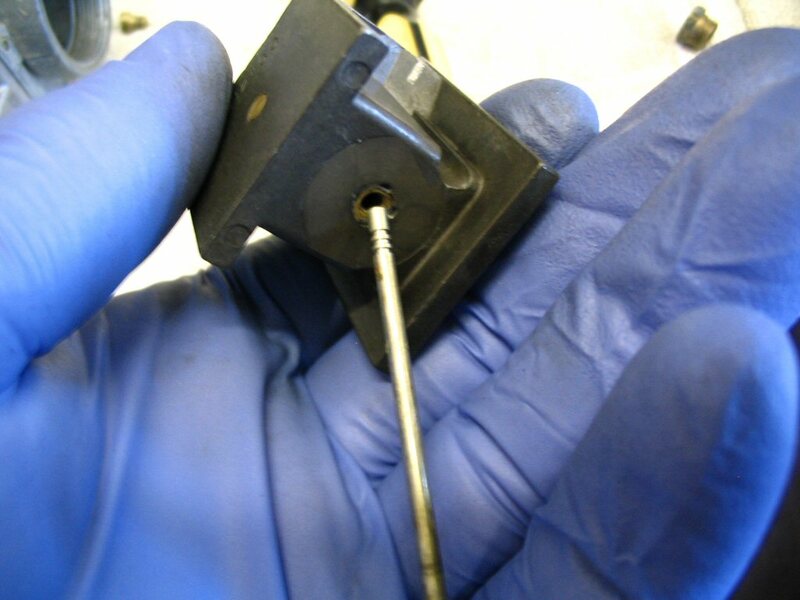 If the splined end gets stuck too far in, the pin is very difficult to remove. The float bowl will prevent the pin from falling out, anyway. 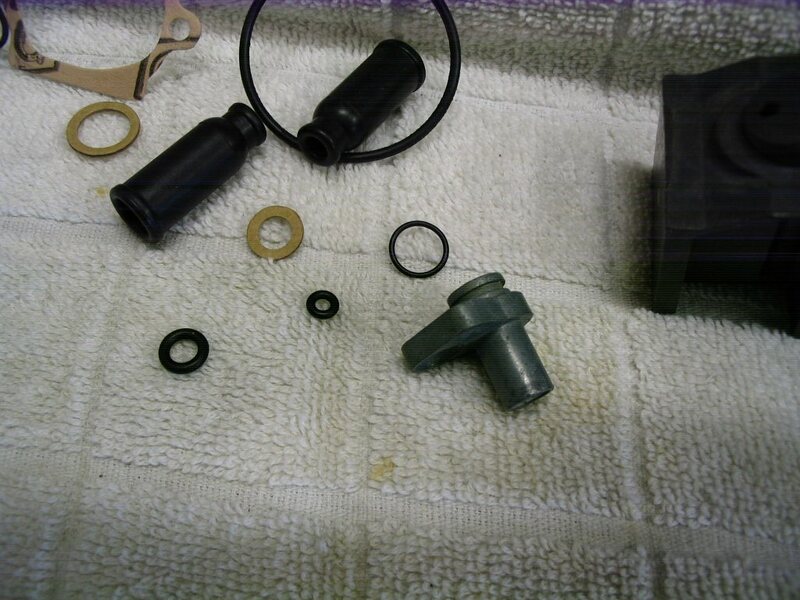 Now it is time to fit the large O-ring to the float bowl. It is easier to do if the O-ring and float bowl are warm. So, if you are working in the winter months, just take it inside the house and let it warm up. Up to now, fitting the O-ring has been easy. Now comes the tricky corner. 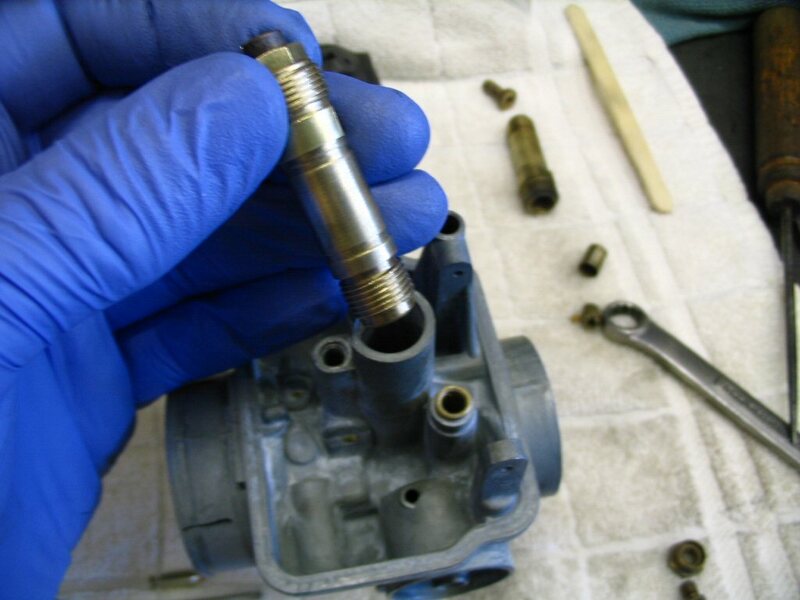 If you roll the O-ring into place, it will immediately try to roll back out. You can fight it for eternity (or until the O-ring breaks) and it'll still want to roll out. The trick is to roll it in the opposite direction just a bit using your thumb and forefinger, and then roll it into place. 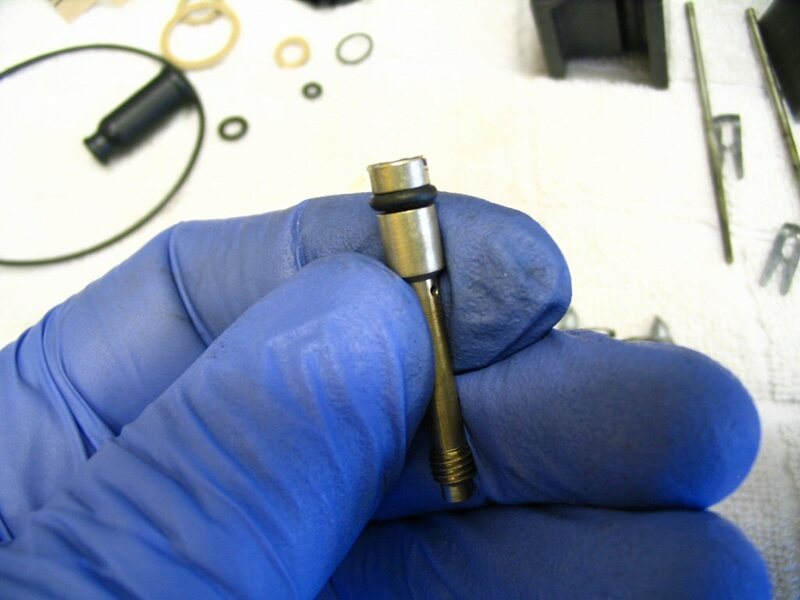 This neutralizes any roll and the O-ring will stay nicely in place. 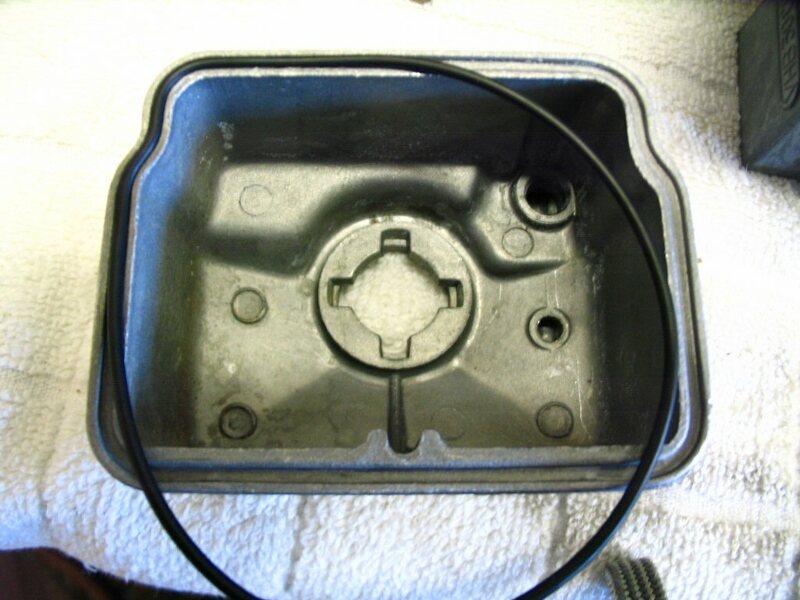 Fit the float bowl to the carb. 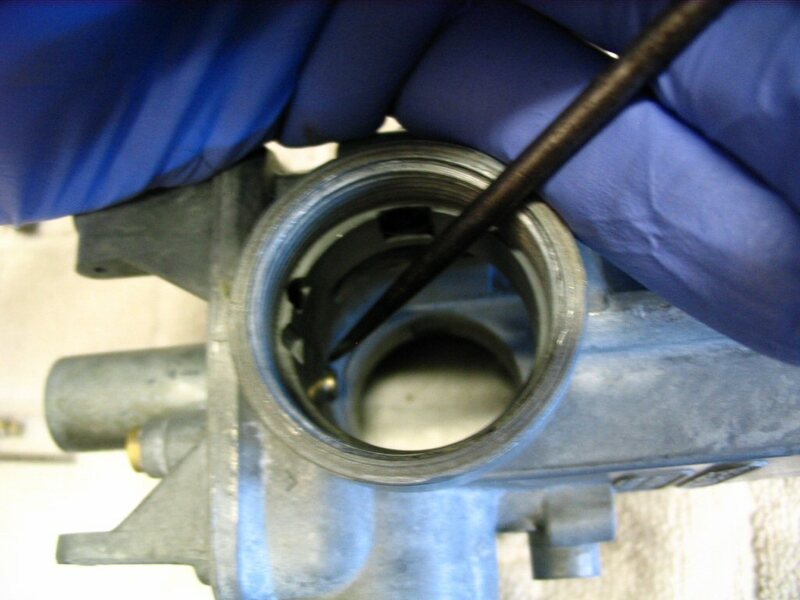 You may need to wiggle it in place a bit as you seat the O-ring on the choke (enricher) jet. 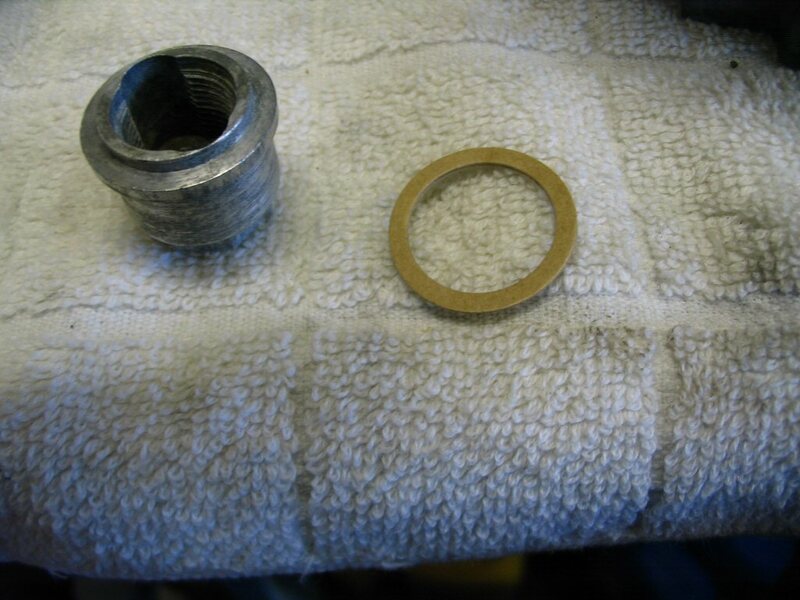 The float bowl nut and gasket. 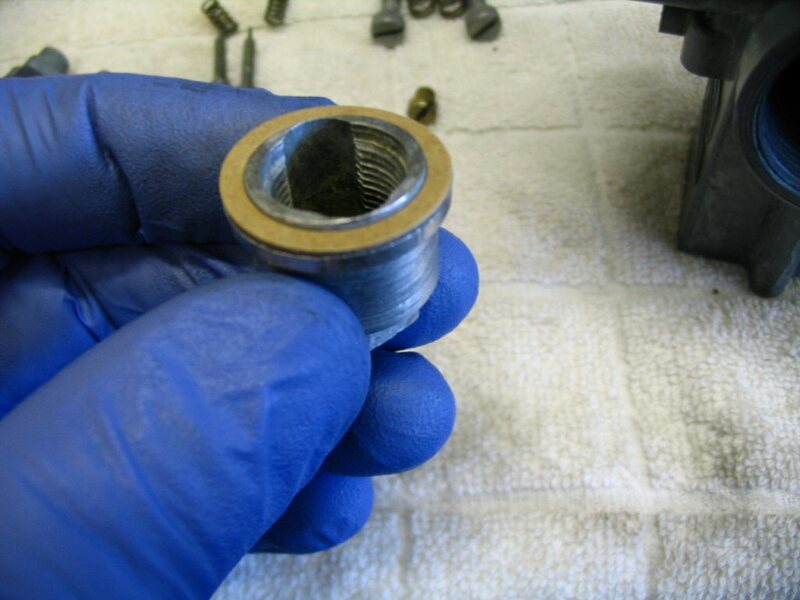 Fit the gasket to the float bowl nut. 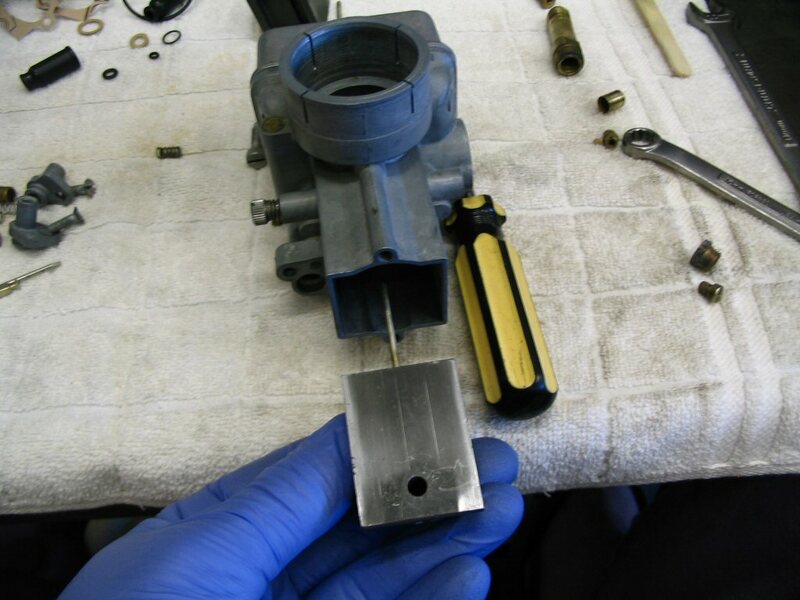 Charlie Mullendore of Antietam Classic Cycle uses a little dielectric grease on the gasket to help it tighten down easier. Screw the float bowl nut in place. And tighten with a wrench. A heavy snug is good here. You want the float bowl tight. But again, we are dealing with soft metals, so take it easy. 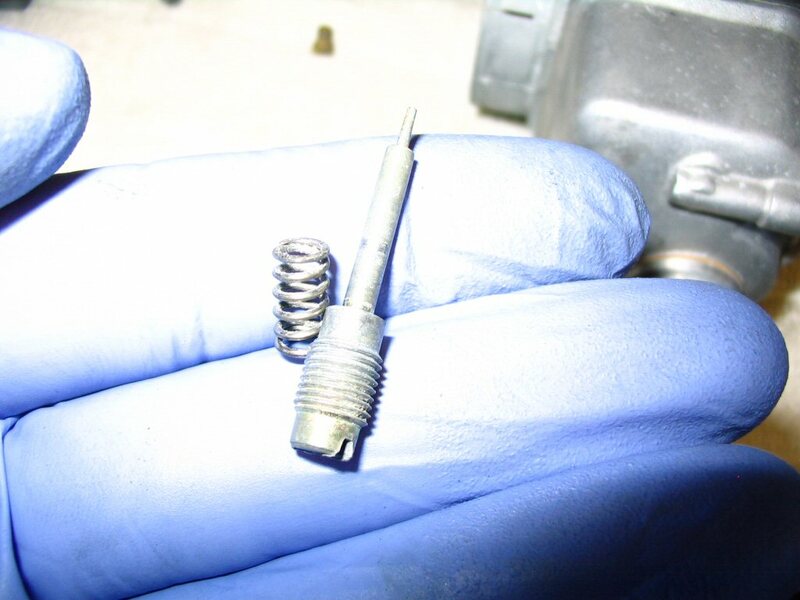 The idle speed screw and spring. 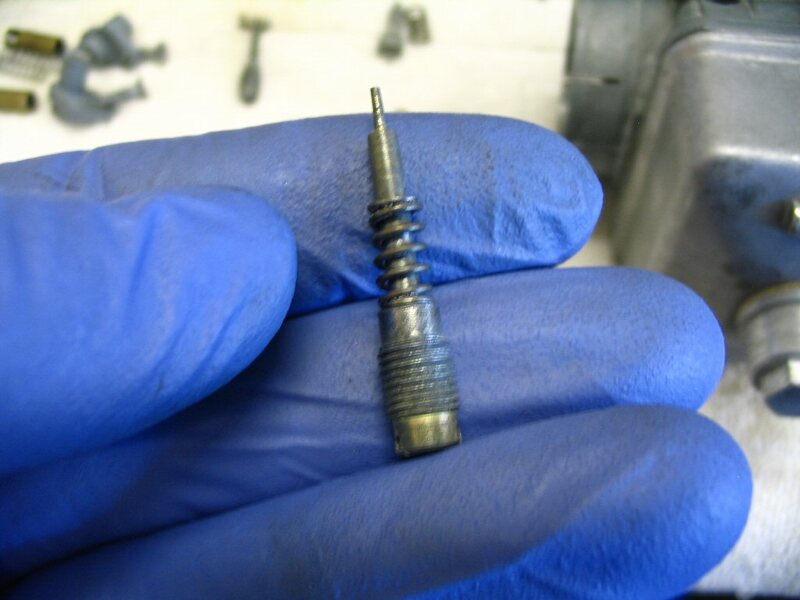 Place the spring on the idle speed screw. 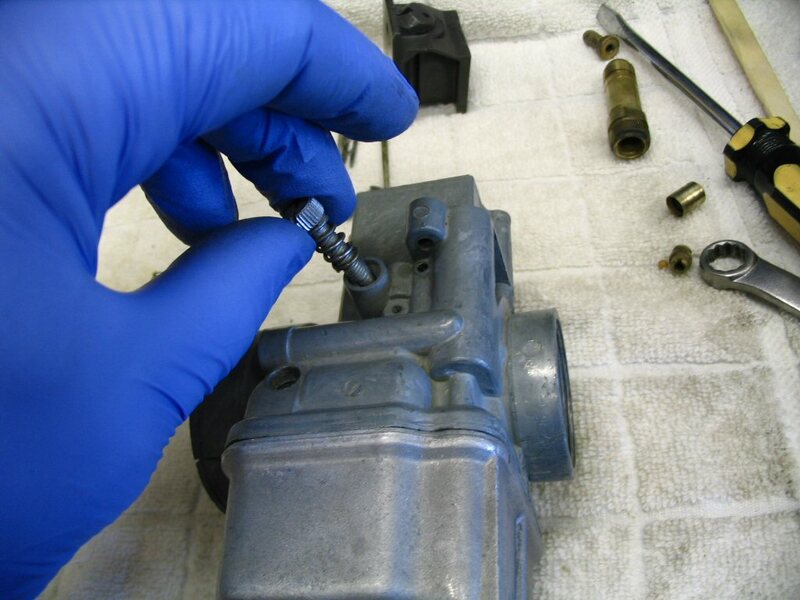 Insert the idle speed screw and spring into the body of the carburetor. Tighten it down a bit. 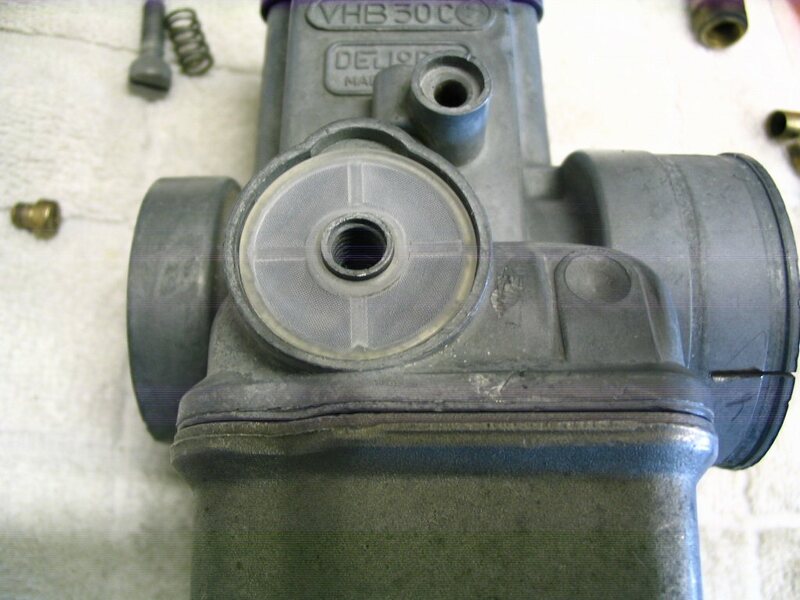 You can see the end of the idle speed screw protruding through to the inside. 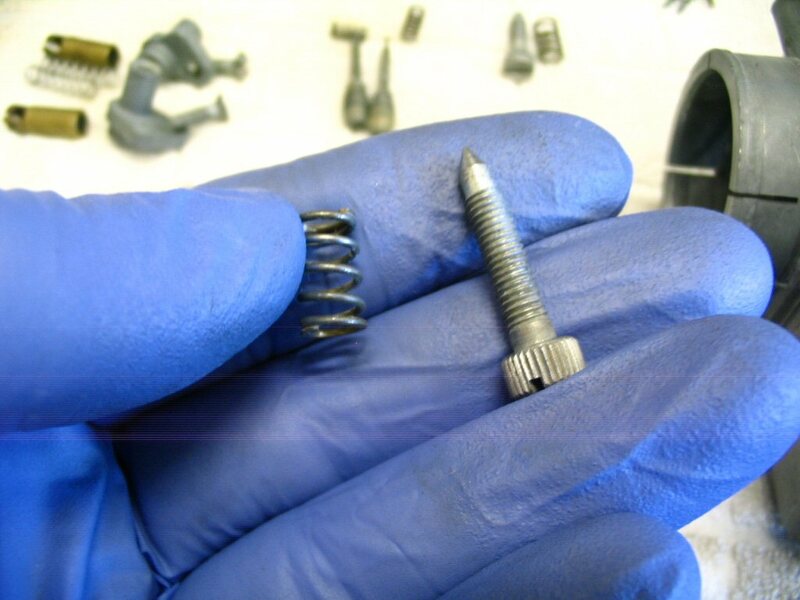 The mixture screw and spring. 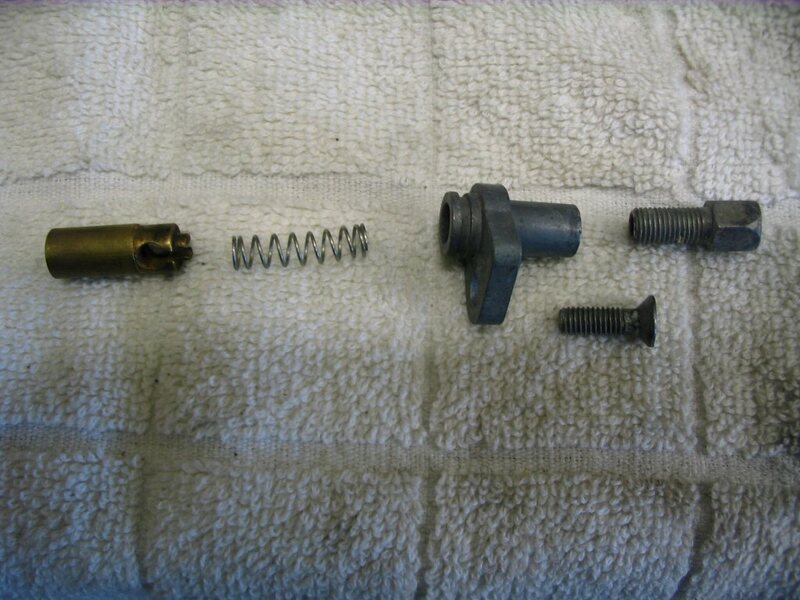 Place the spring on the mixture screw. 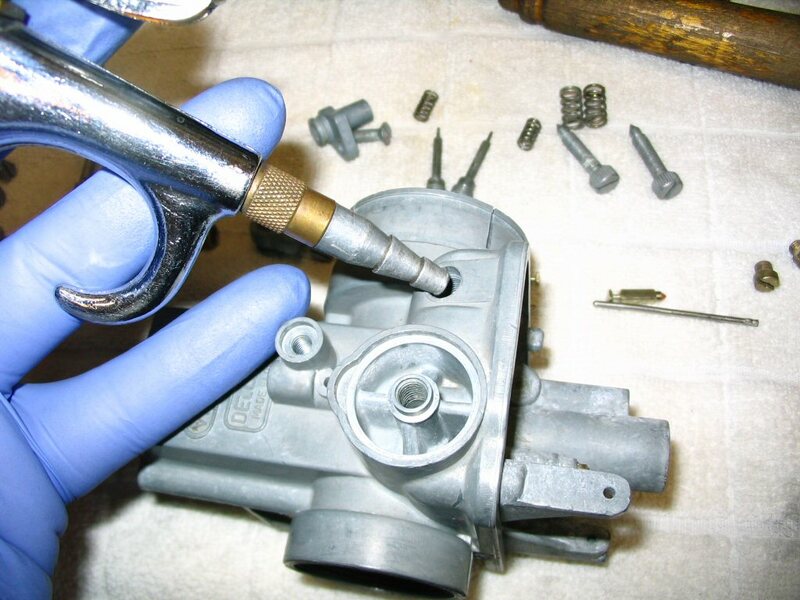 Insert the mixture speed screw and spring into the body of the carburetor. Screw it in until it bottoms out. DO NOT OVERTIGHTEN! Just bottom it out gently. 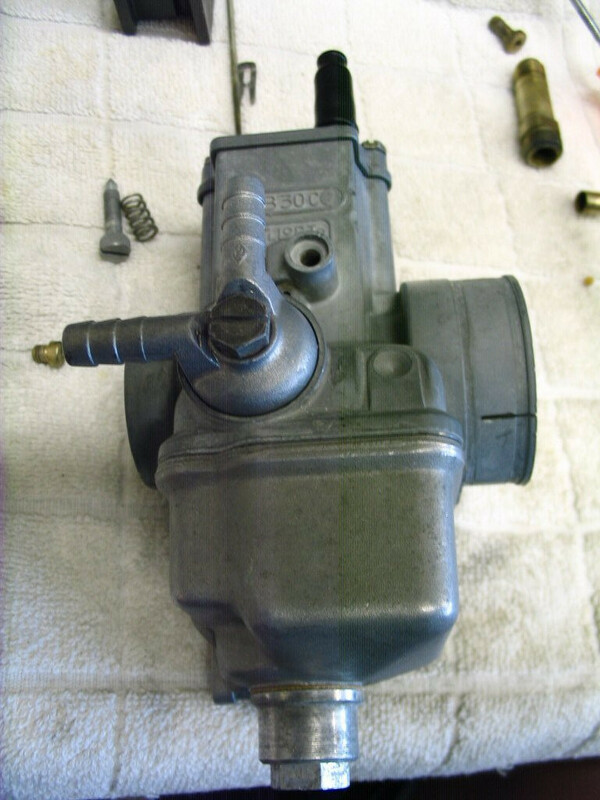 Then, back it out the number of turns specified by the workshop manual (generally 1 1⁄2 - 2 turns for the left carburetor and 1 3⁄4 - 2 1⁄4 turns for the right carb). The slide and tapered needle. Insert the top of the tapered needle into the bottom of the slide and push it through. I do it this way so that I avoid any potential damage to the tapered needle. 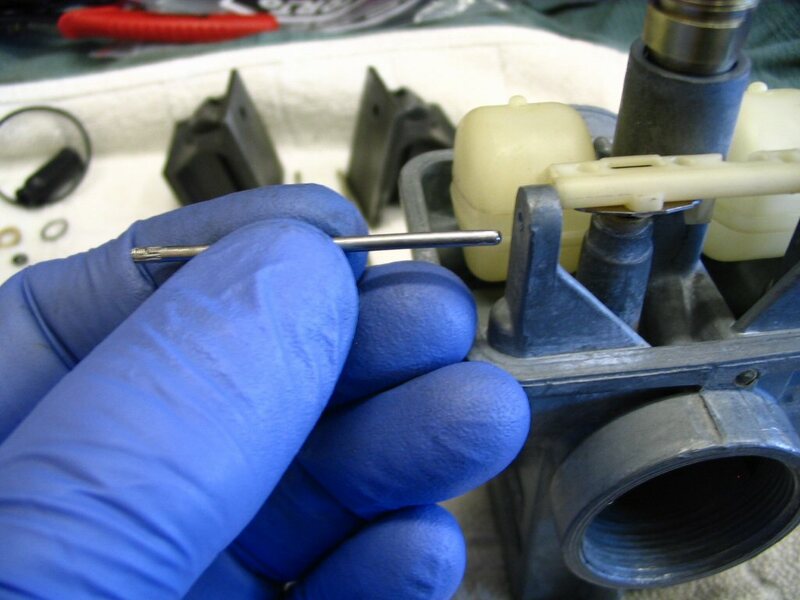 Place the needle clip in the position specified by the workshop manual (generally the middle). 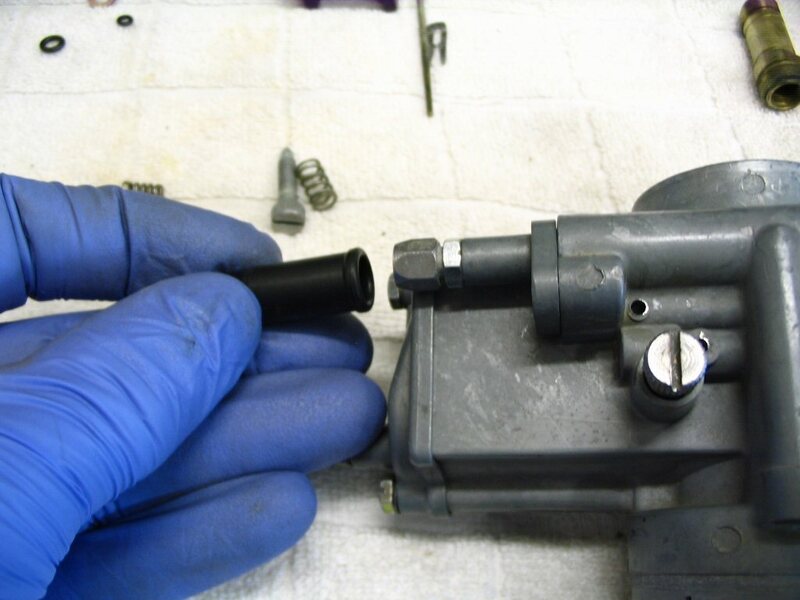 Insert the slide complete with tapered needle into the body of the carburetor. 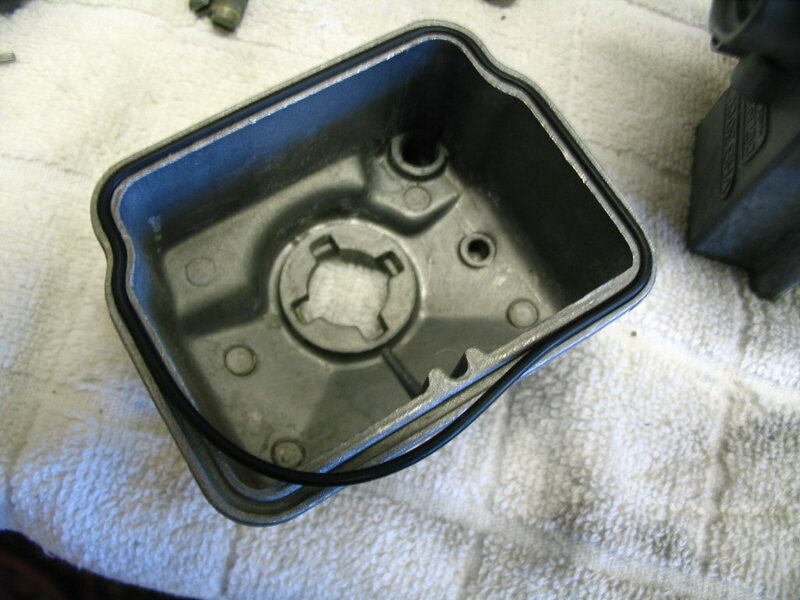 Notice that the large flat area of the slide must face the intake manifold, not the air filter. 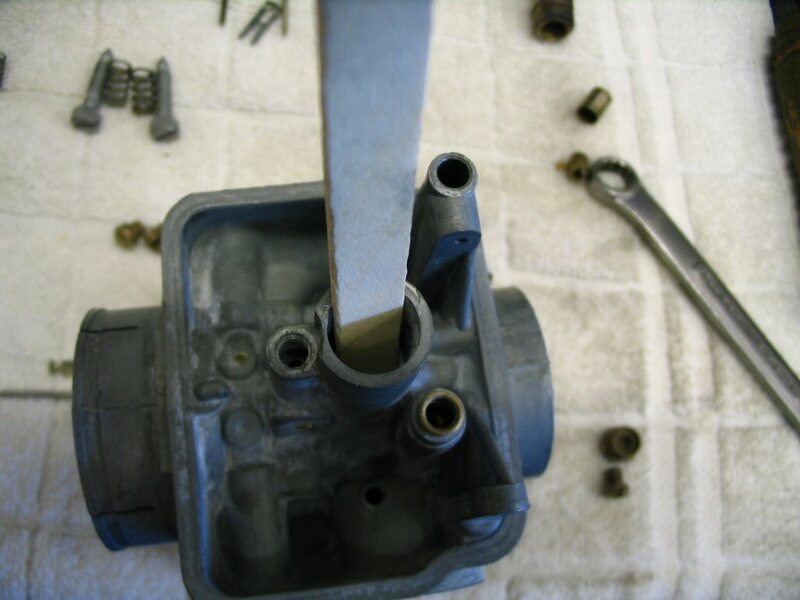 The carburetor top and gasket. 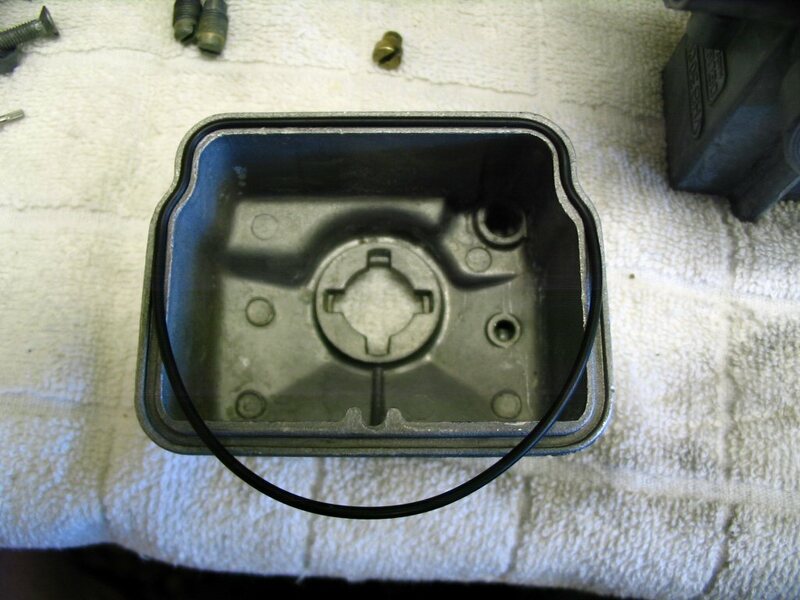 Fit the gasket to the carburetor top. 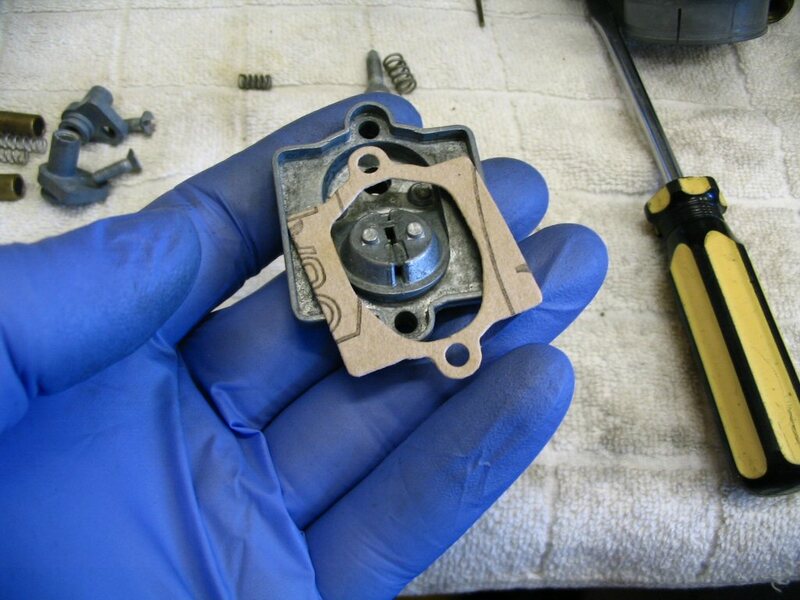 I like to slather on some grease in a hopeless attempt to keep the gaskets from shrinking. Insert the bolts complete with wave washers. Insert the cable adjuster complete with jam nut. 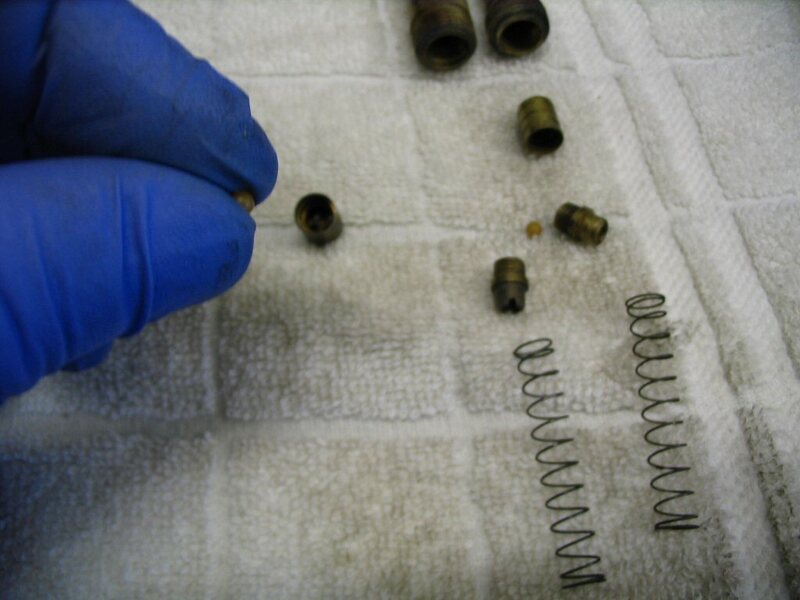 Here is the throttle return spring. Notice that one end has the wire bent in toward the middle. 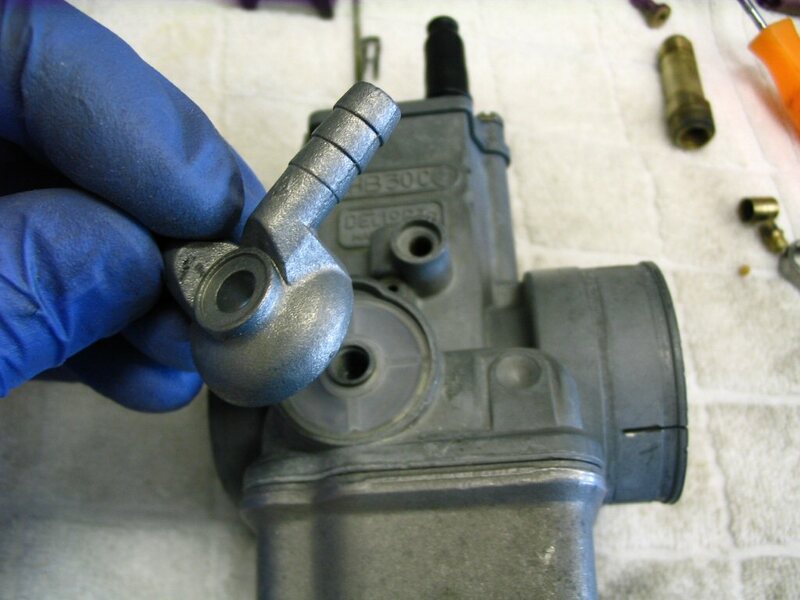 Insert the bent end into the carburetor top. This holds the spring in place. 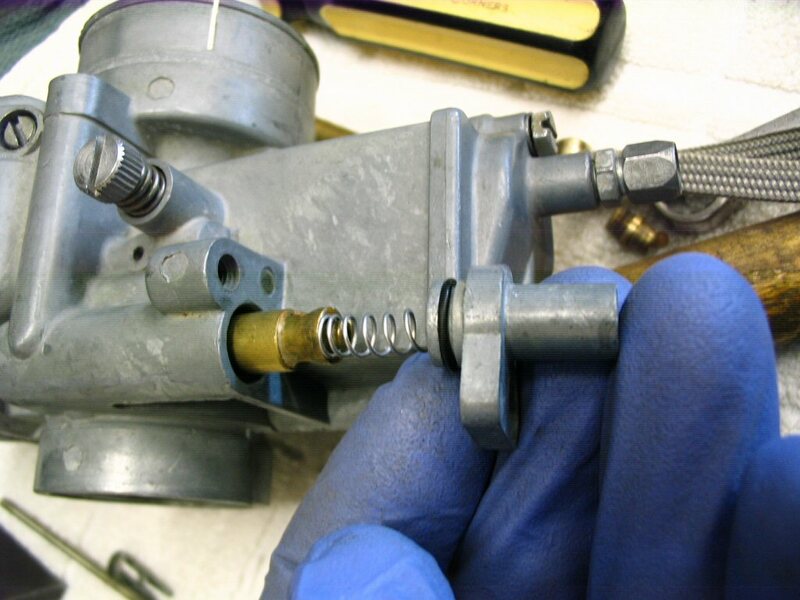 Now place the carburetor top complete with spring onto the top of the carburetor. 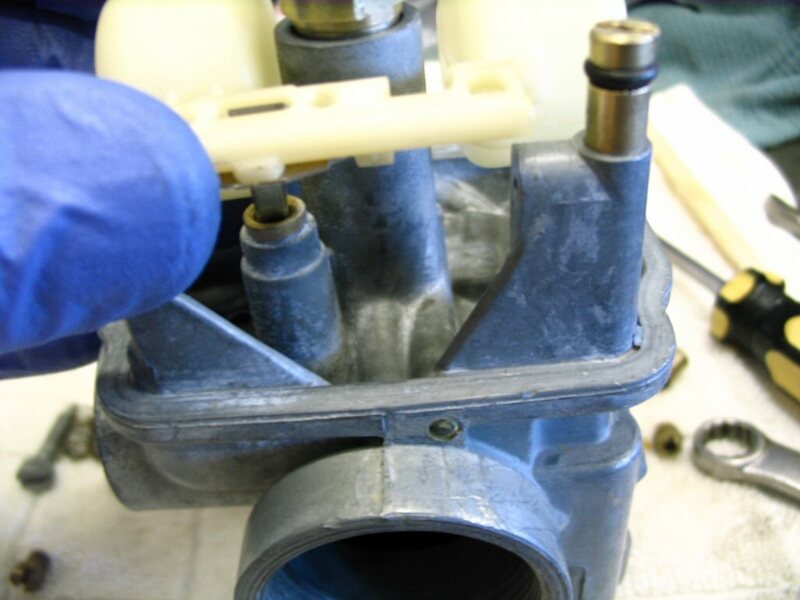 Note that the cable adjuster is positioned nearest the intake manifold, not the air filter. 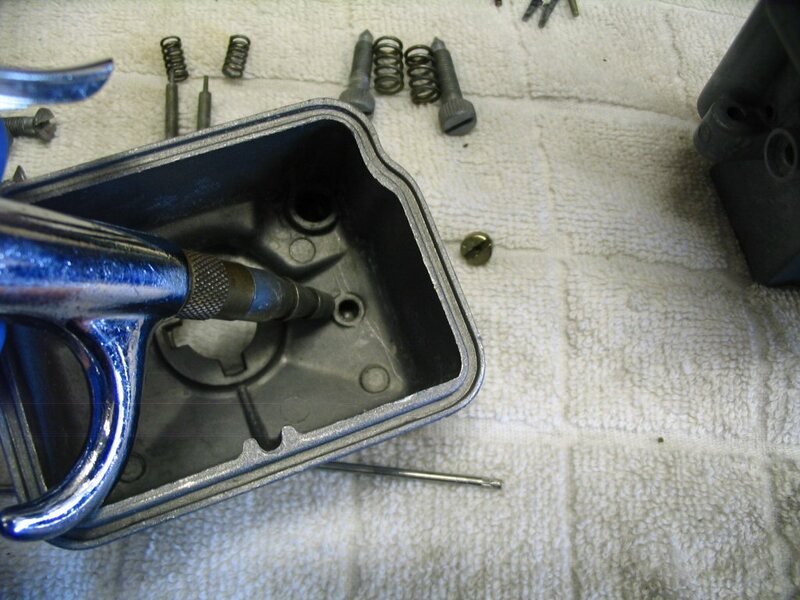 Hold the top down on top of the carburetor body and screw the top in place. 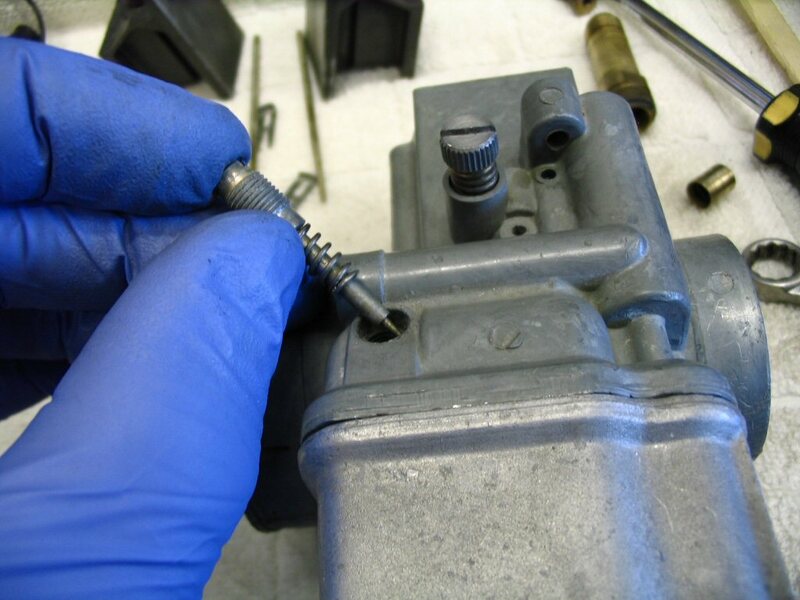 DO NOT OVERTIGHTEN THESE BOLTS! They only take a light snug and are far too easy to strip. Be careful. 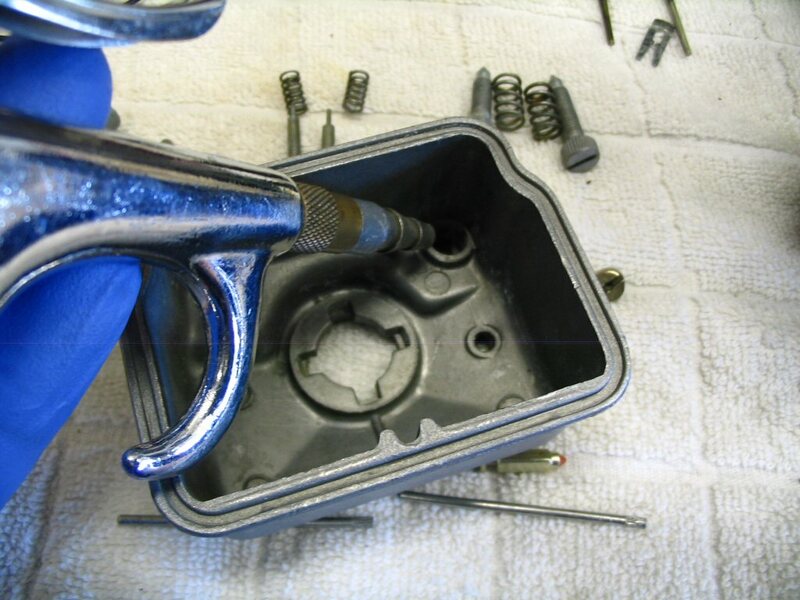 I will also reemphasize, hold the top in its finished position and then screw the bolts in place. That is, don't use the bolts to pull the top into position. 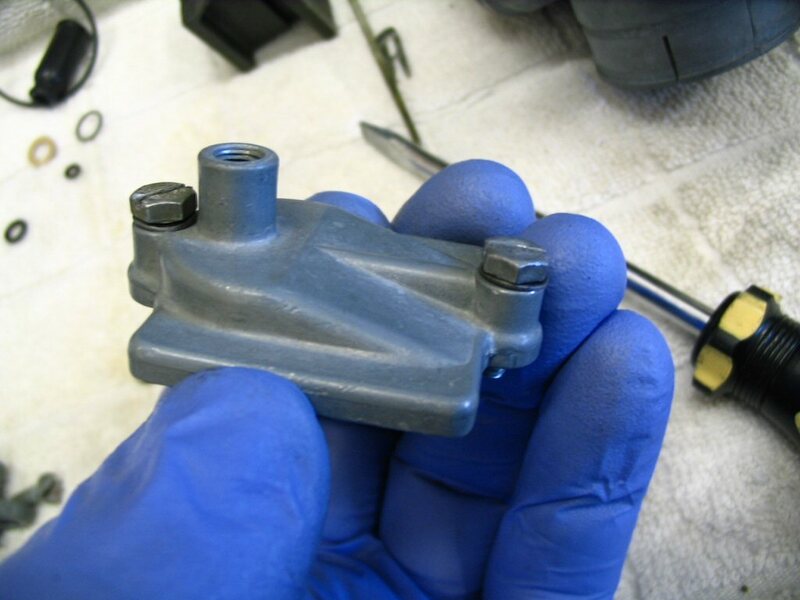 Here is the choke (enricher) assembly. 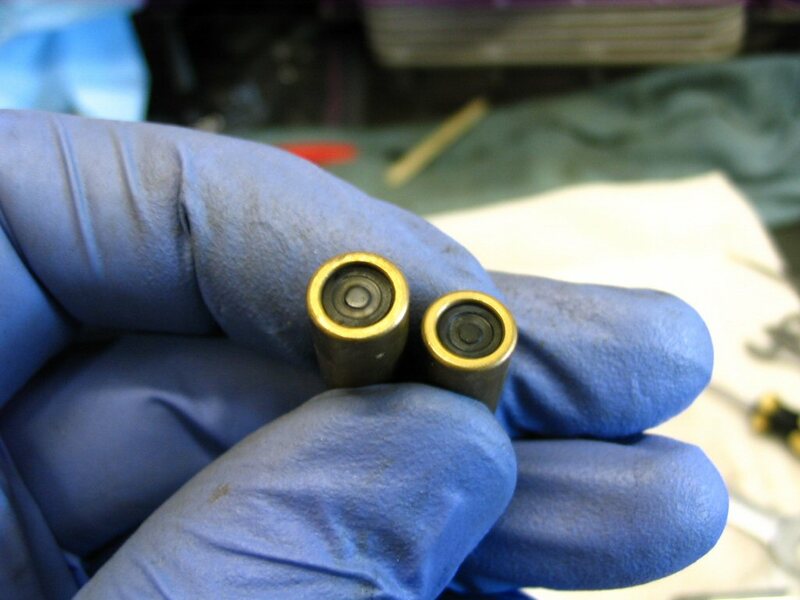 This is the sealing surface of the choke (enricher) plungers. 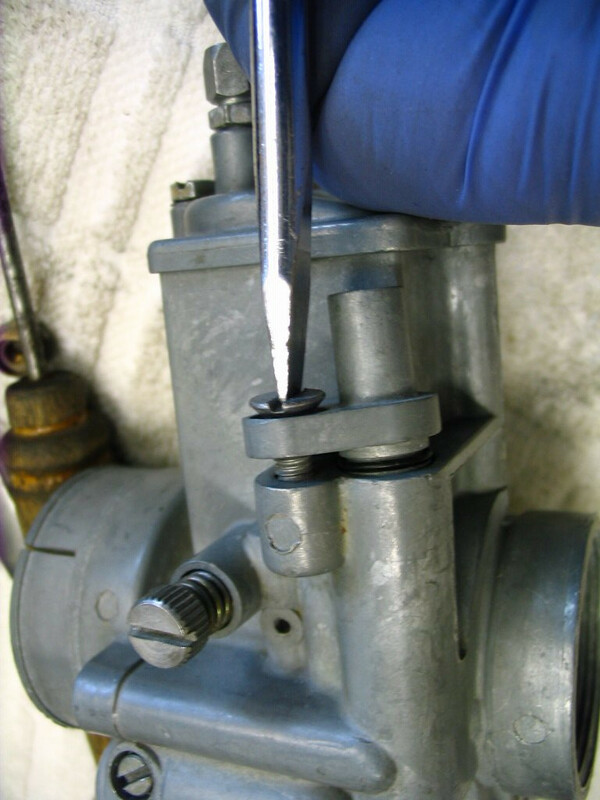 New plungers have a flat sealing surface that has not been indented by years of constant spring pressure. While these may function fine, I will not reuse them. 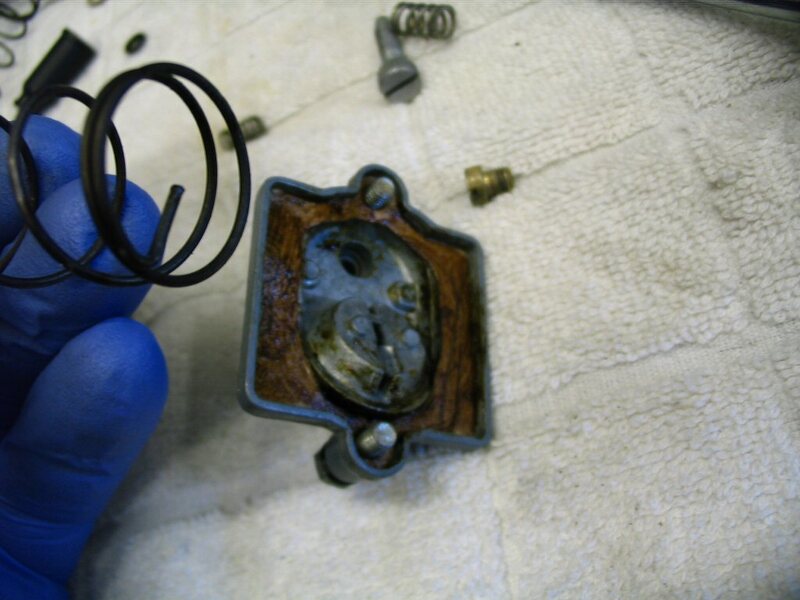 New ones are inexpensive and easily replaced. 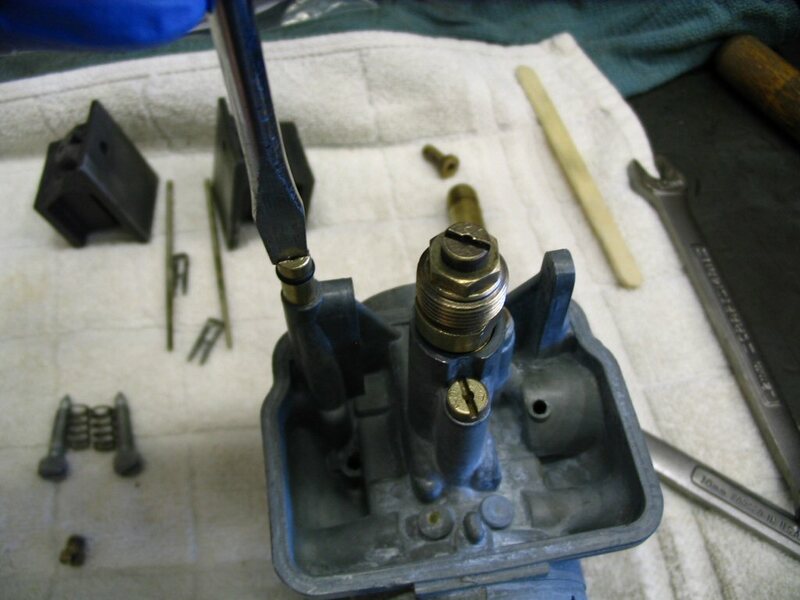 Adam S. recommends the following technique to extend the life of the plungers: One trick that I use, and it works fine, is to remove the rubber plug from the choke plunger, using a small dental pick. 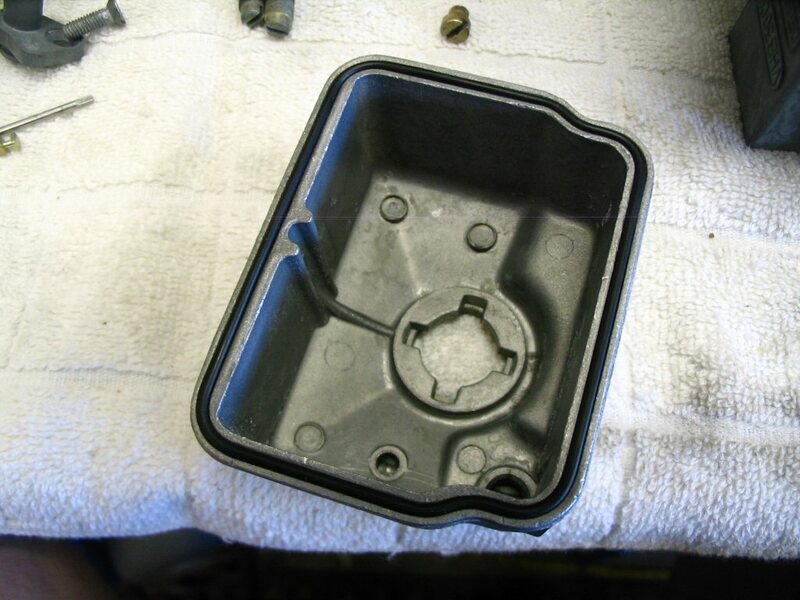 Flip the rubber piece over and you'll have a nice new sealing surface. 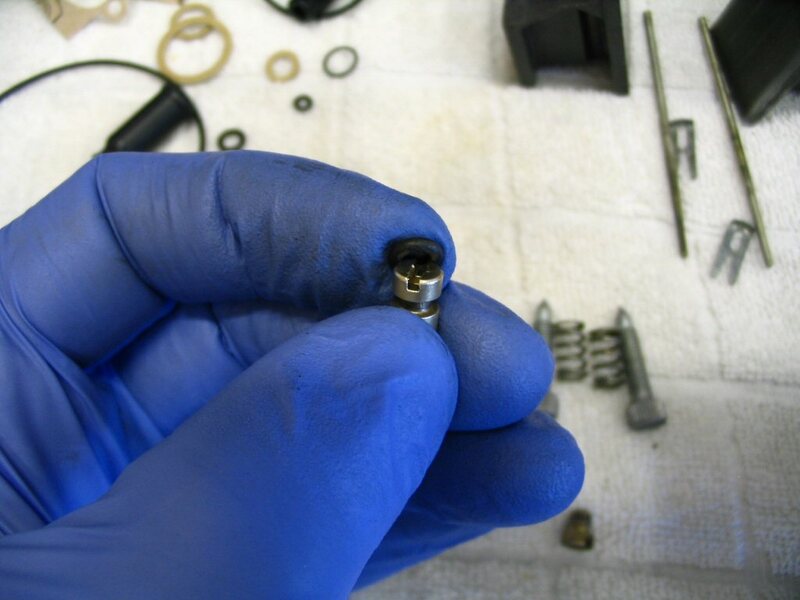 The body uses the largest of the small O-rings. And fits in place like so. Insert the assembly like this. And secure in place with the screw. 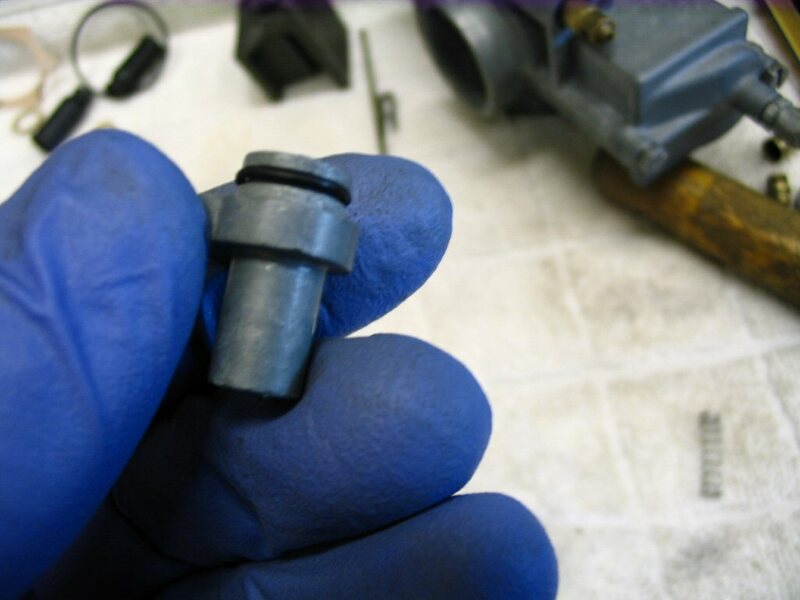 Place a rubber dust cap on the cable adjuster for the choke (enricher). 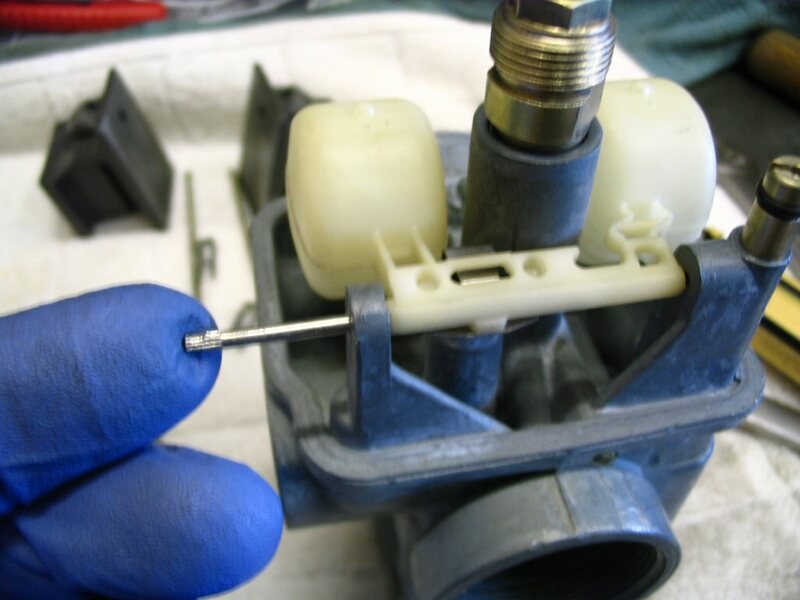 And place the other rubber dust cap on the cable adjuster for the throttle. 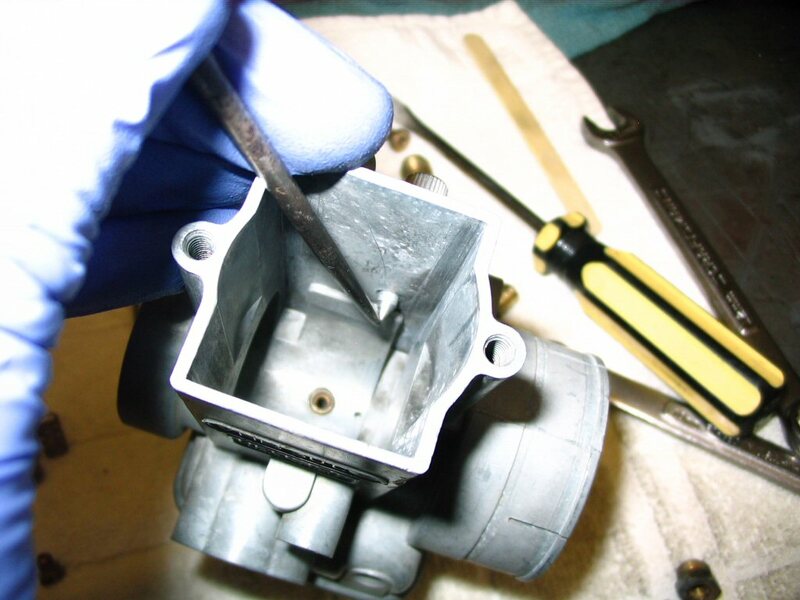 Fit a new plastic fuel filter to the carburetor fuel inlet. 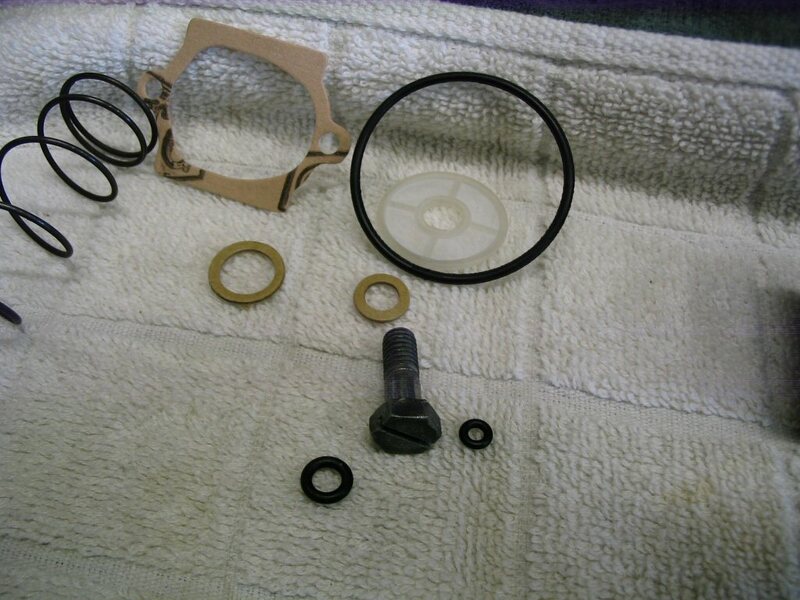 Note: the filters do not come with the carburetor kit and must be ordered separately. Here it is in place. 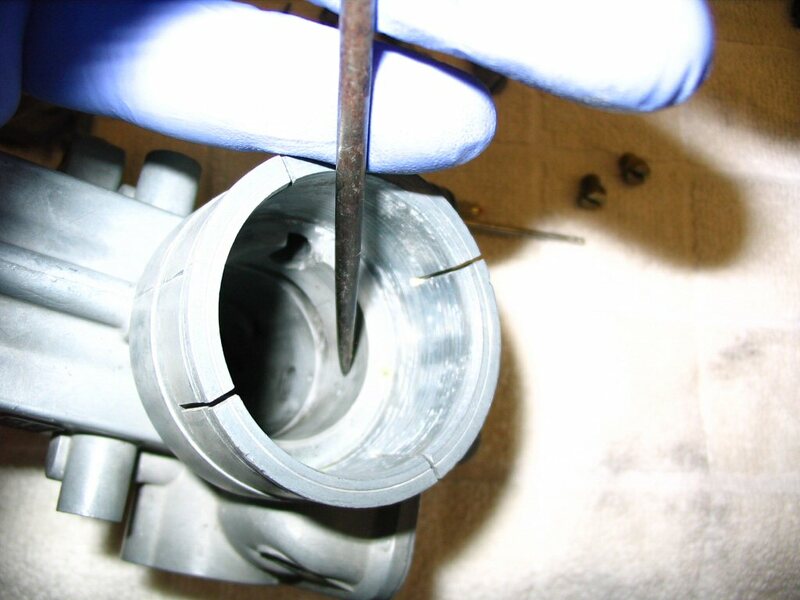 The center of the filter usually needs to be pushed in place over the protrusion in the carburetor inlet. Fit the banjo in place. Select the smallest of the fiber washers. Place it on the bolt. 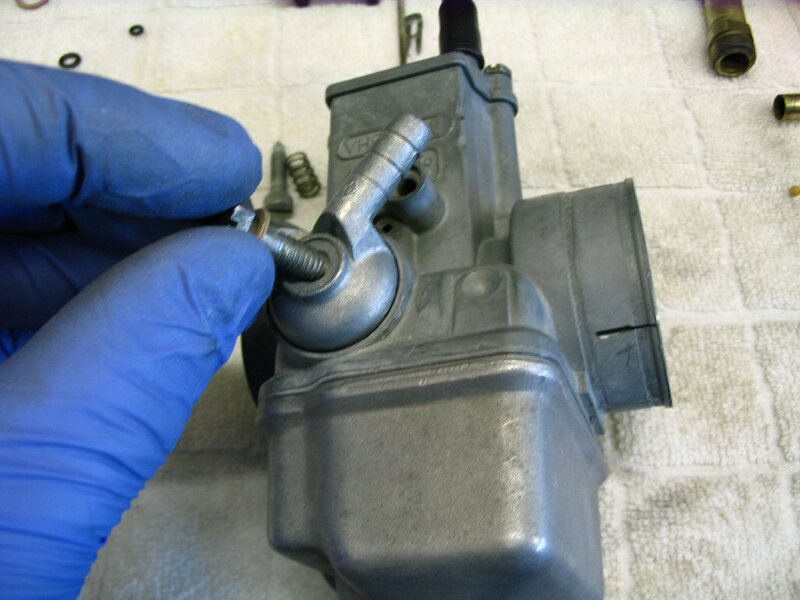 Insert the bolt into the carburetor body. And tighten to secure. 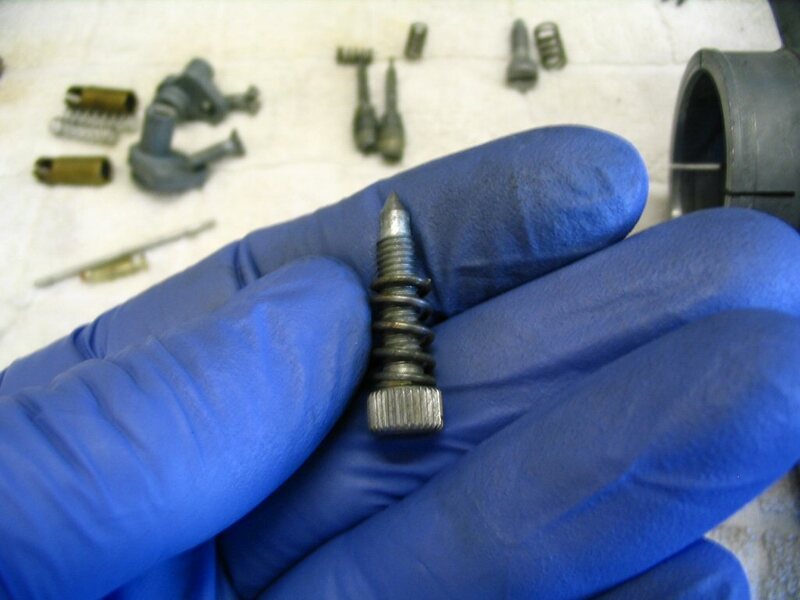 You'll want to snug the bolt, but not over tighten. 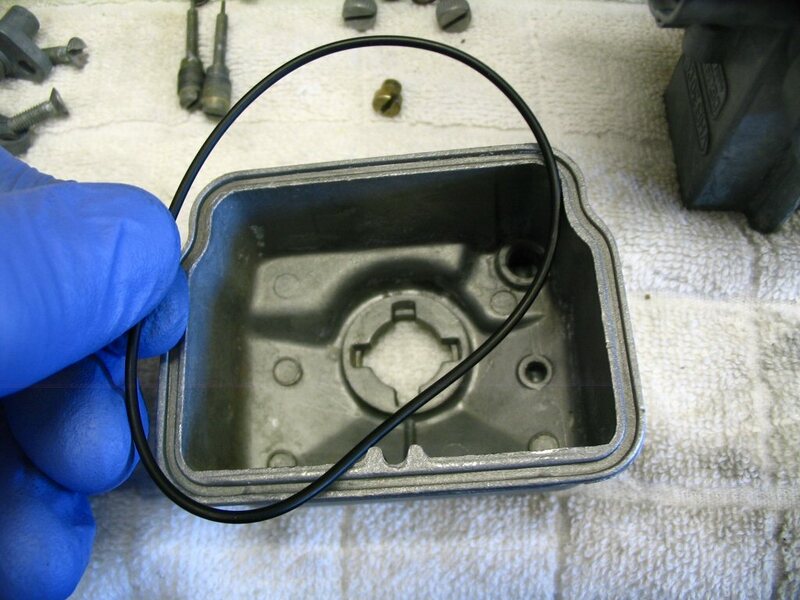 If fuel leaks from this location when you hook up the tank, check a couple things. 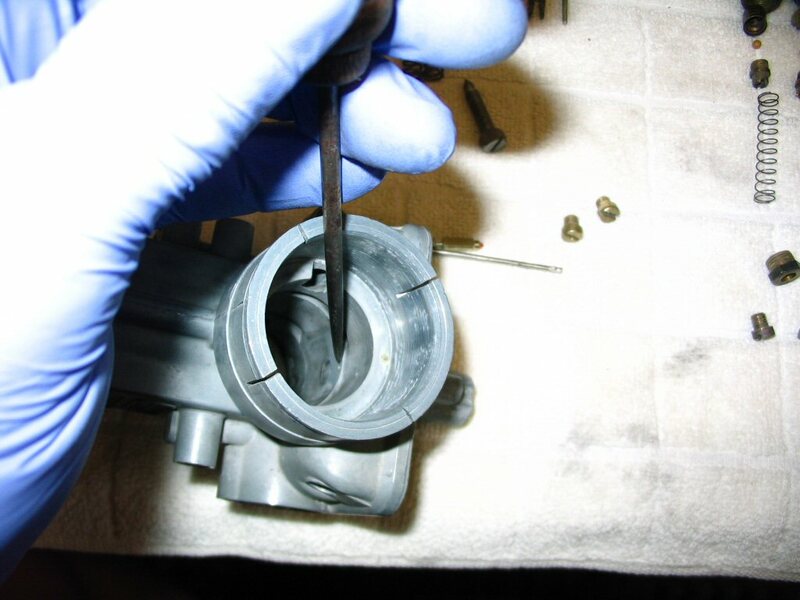 (1) Did you fit a new plastic filter? If not fit one. 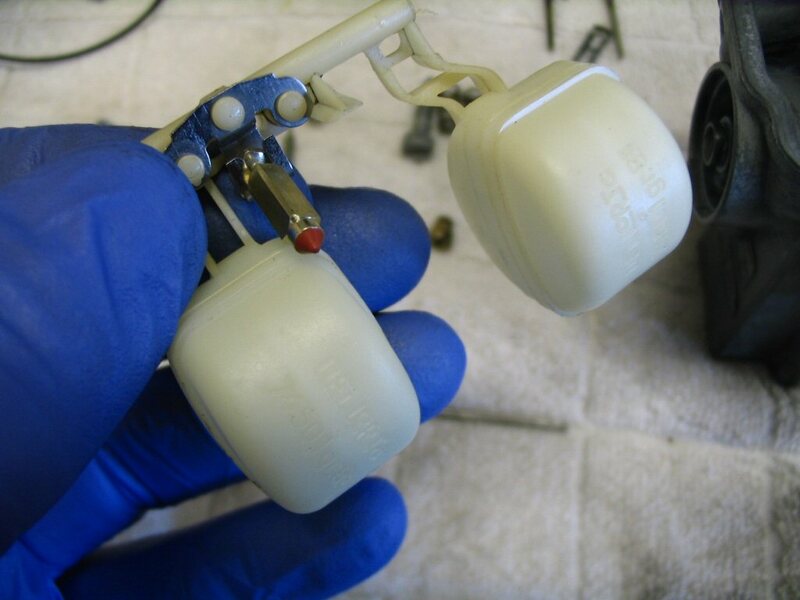 (2) Is the banjo fitting bottoming out before it makes sealing contact with the plastic filter? I had one that did this. Drove me crazy until I figured it out. I fit a new banjo and it sealed immediately. 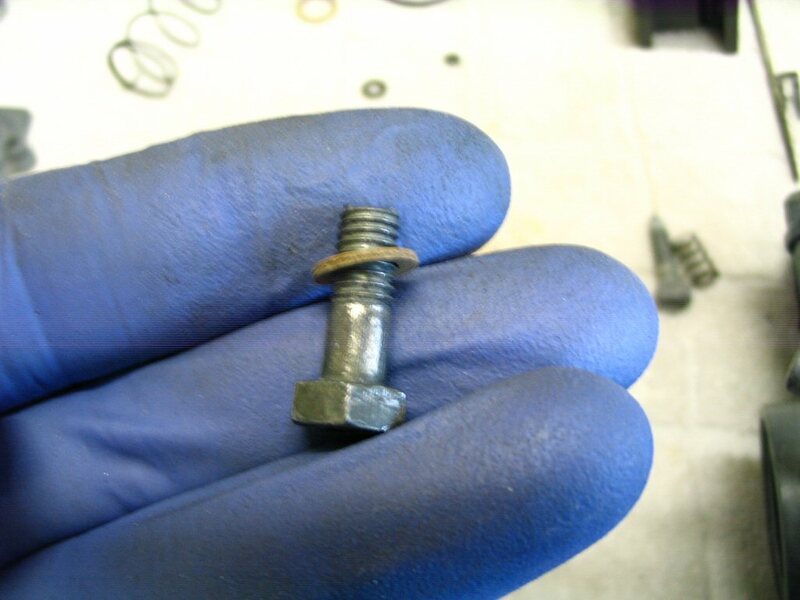 Do be careful not to over tighten these bolts. The threads are somewhat easily striped. 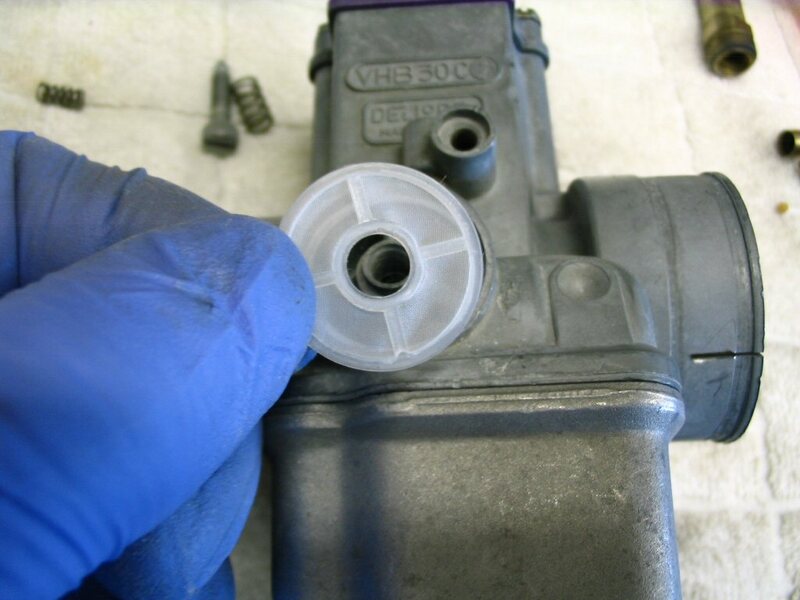 It is much easier (and cheaper) to replace the plastic filter and banjo than to deal with buggered threads. JUST ANOTHER QUARTER TURN IS NOT YOUR FRIEND!